This motorbike loop, spreading southwest of Hanoi, is only a few hours’ ride from the capital, and yet it takes in some of the most picturesque scenery in the country, and covers some very remote corners along the border with Laos. Much of the Limestone Loop travels through Thanh Hóa, a province of limestone pinnacles, rivers and rice paddies. Quiet roads meander along steep valleys cloaked in bamboo forests, and mountain passes twist skyward towards isolated Lao border crossings. Thanh Hóa is overlooked by most travellers in favour of neighbouring Ninh Bình, which is now extremely touristy. Thanh Hóa, on the other hand, is only recently starting to attract attention, in particular the stunning setting of Pu Luong Nature Reserve. All of this excellent scenery is more accessible than ever, thanks to upgraded roads, which make it possible to get from the urban chaos of Hanoi to the pastoral tranquility of Thanh Hoa Province within a few hours. I’ve written this guide in 5 sections going anticlockwise on the loop (although you can ride it in ether direction). 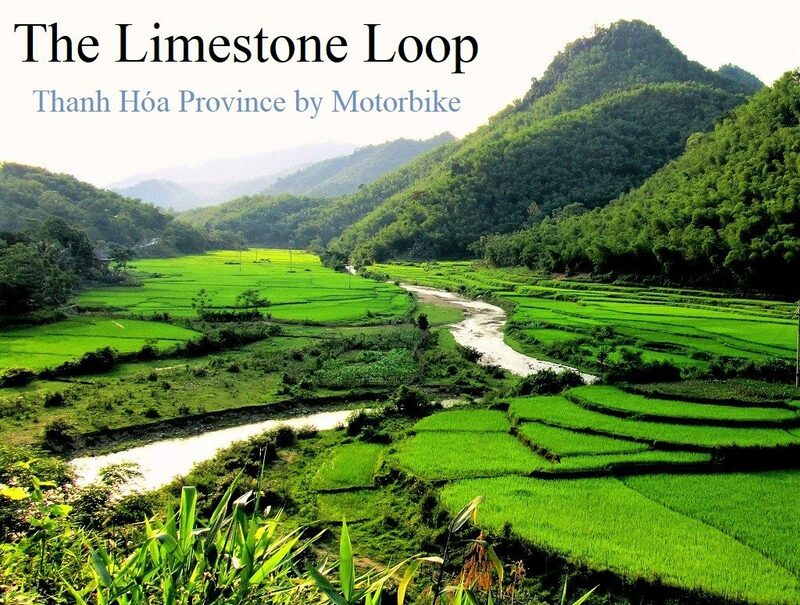 The Limestone Loop is actually a figure of ‘8’, starting and ending in Hanoi, going via Mai Chau, Pu Luong, the ‘Lao Loop’, and the Ho Chi Minh Road. As a complete loop it’s a very rewarding ride, but you can also choose to ride just a couple of sections of it. The total distance is 700-800km, including a few optional side routes that I’ve marked in red. Each section of the guide below contains a description of the ride plus my recommendations for food, drink and accommodation along the way, all of which are marked on my annotated route map. To really make the most of the Limestone Loop, spend 5-7 days riding it, but for those with less time, 3 days is adequate. In general, there are gas stations at fairly regular intervals, apart from the Lao Loop (Section 3). There are some rough road conditions on the main route and on the side routes, but I have marked them as best I can on my map. The best weather conditions are usually spring (April, May) and early autumn (September, October). Bear in mind that the winter months (December-February) can be surprisingly cold and grey. I like to think of Vietnam as a long dragon: its head is the northern bulge around the Red River, its body the long, narrow central stretch, and its tail is the Mekong Delta in the south. Thanh Hóa is located in the ‘throat’ of the dragon. It’s a transitional province between northern and central Vietnam. To the north is the heavily farmed and populated Red River Delta, to the east is the sea, to the south is the poor, rural province of Nghe An, and to the west is the mountainous border with Laos. However, in order to get to Thanh Hóa Province from Hanoi, it’s first necessary to face the long, soot-blackened crawl out of the capital and through the grim industrial suburbs. This is not a pleasant ride, but by combining the modern Thang Long Highway, heading west of Hanoi, with a couple of back-roads, it only takes an hour or so before the trucks, dust, and factories fade away. At Xuan Mai, turn west on Highway QL6 (also marked AH13). Trucks still litter the road, but a few kilometres west of the Xuan Mai crossroads, a good back-road cuts a corner off Highway QL6, thus avoiding the city of Hoa Binh. 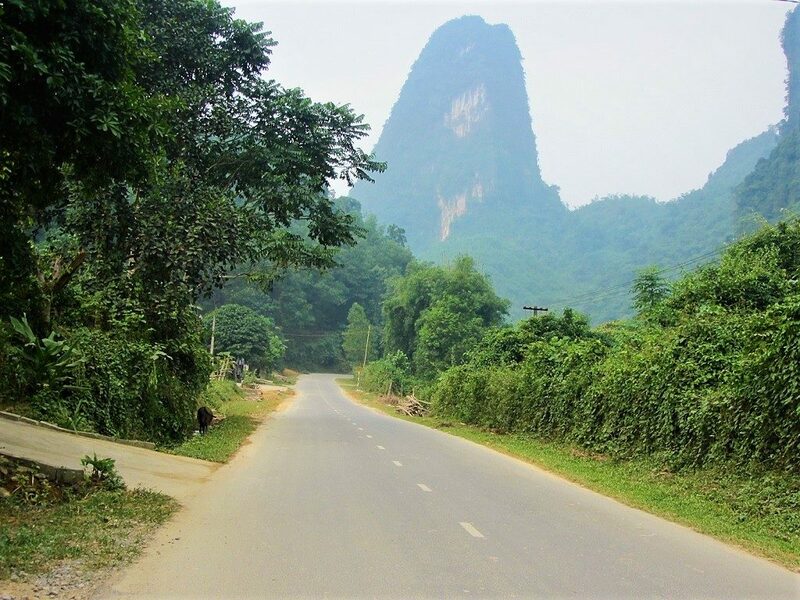 By combining roads ATK and DT12B – via some lovely rural scenery, including clear rivers and limestone pinnacles – you can rejoin Highway QL6 south of Hoa Binh. Immediately after turning down Road ATK, fields, greenery and mountains begin to take the place of concrete and dust. The limestone scenery in this pretty valley is a taste of what lies ahead on this loop. There’s an inviting-looking, homestay-style guest house on Road ATK, called Nha Nghi Hoa Hong. It’s housed in a wood-and-thatch structure with access to a stream behind it for bathing. Hoa Hong makes a pleasant night stop if you left Hanoi late in the day and are running out of daylight. On the second back-road (DT12B) there’s a nearby hot springs (Kim Boi) and a waterfall (Tu Son), both of which can be visited as a quick stop or overnight. After rejoining Highway QL6 south of Hoa Binh, limestone crags start to grow up around the rice paddies, looming over the villages. An Lac Hotel, near the junction of QL6 and QL12B, is a classic, old, northern-style accommodation that’s practically jammed beneath a limestone karst. 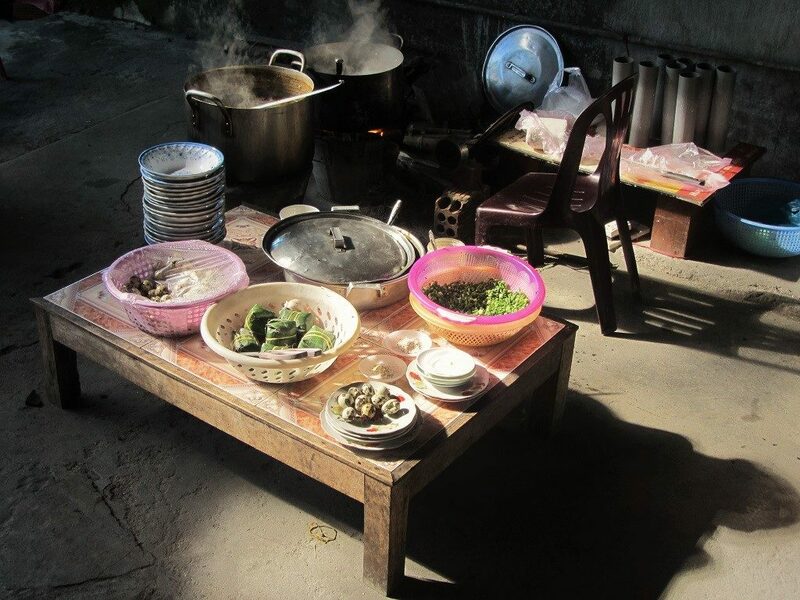 It’s a big, echoey place – there’s almost something haunting about it – and, although the quarters are pretty basic, it’s an atmospheric place for a night if you don’t have time to get to Mai Chau before sundown. Things start to get really scenic when Highway QL6 (in excellent condition) veers west and ascends the wide, steep Thung Khe Pass. A couple of sweeping switchbacks wind their way up the foothills of what the French colonials used to call the Tonkinese Alps. As the road soars, the air gets cooler (or freezing cold if you’re travelling in the winter months). Dozens of freight trucks, bound for the remote northwest of the country, crawl painfully up the mountainside, but because the pass is so wide and well-maintained, traffic isn’t usually a problem. From the roadside viewing shacks, there are incredible vistas over range after range of pointed limestone peaks that appear to be growing up around the Đà River (Black River). The top of the pass is often shrouded in a thin mist, which allows sunlight to seep through, creating an ethereal atmosphere. 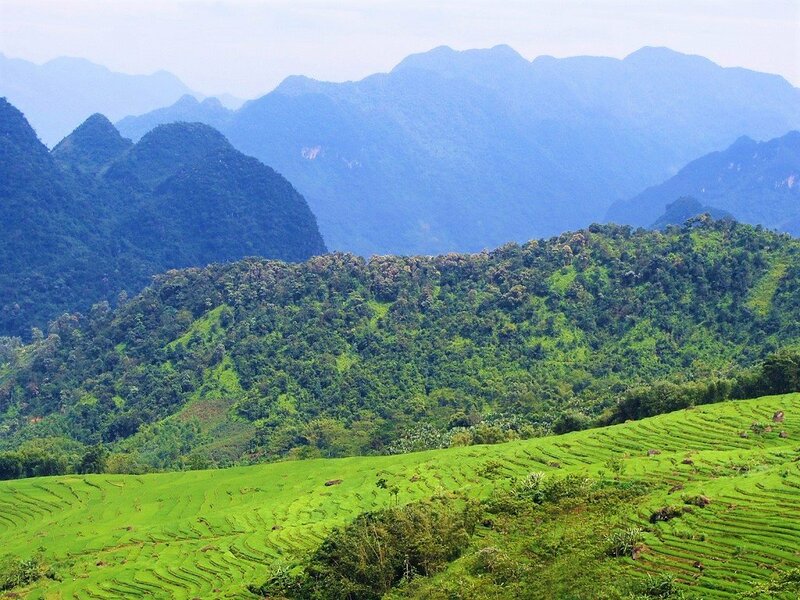 As you roll down the other side, there are famous views over Mai Chau Valley, with its carpet of green rice paddy growing within the tight confines of towering shards of limestone. 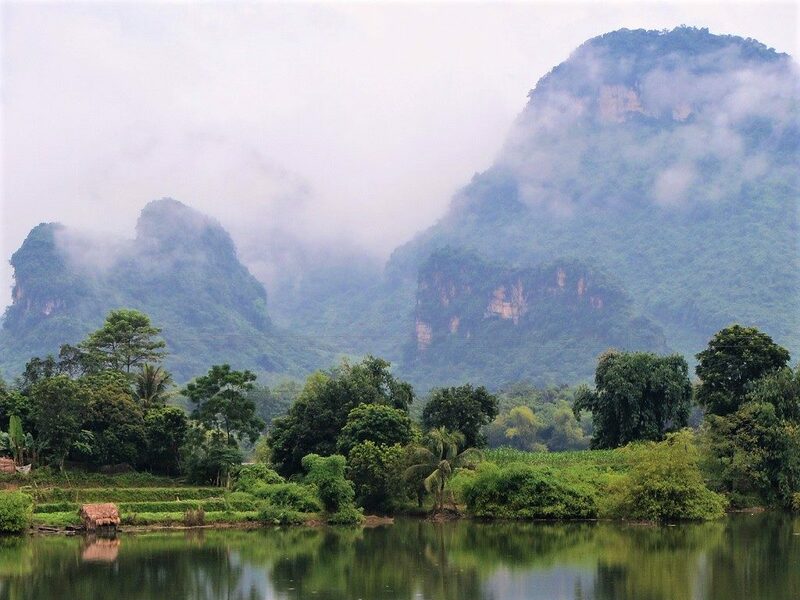 It’s a fitting introduction to Thanh Hóa Province, which lies just south of Mai Chau. Turning sharply at the bottom of the pass onto Road QL15, you enter the green embrace of Mai Chau Valley. Suddenly, the might and grandeur of the mountain pass is replaced by what feels like a bucolic and benevolent landscape (at least, in good weather). The road follows the course of a small, clear river as it runs through a disproportionately wide valley. 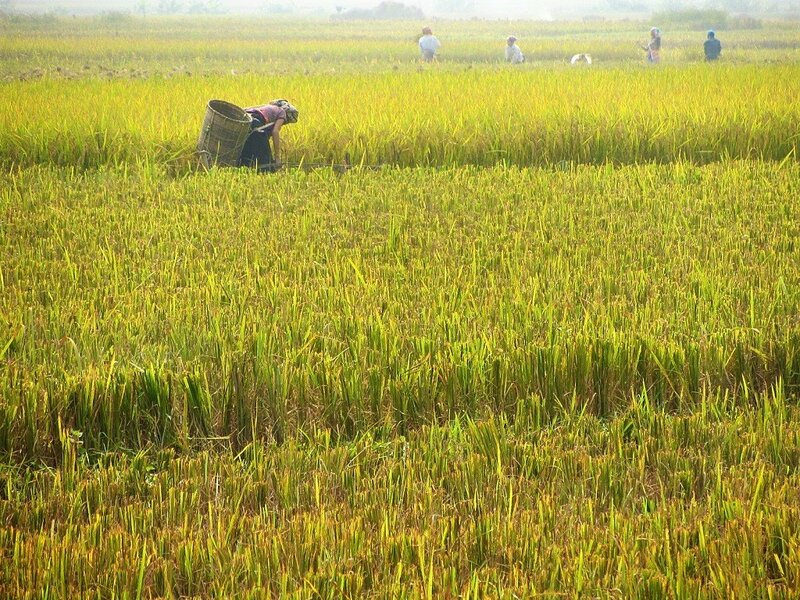 The width means that either side of the river is flat, arable land, covered in a blanket of rice. Small, wooden settlements cluster on raised ground near the river at regular intervals. The town of Mai Chau, however, is all concrete. It’s a sprawling, rather ugly place, but has a lively village atmosphere in the mornings and early evenings, when good, cheap food is available from streetside vendors. In particular, Bún Chả Mai Châu serves up a good version of the classic Hanoi-style pork noodles in a sweet and sour broth. And the market always has some local delicacies to choose from. There are a handful of good mini-hotels in Mai Chau village, although most travellers choose to stay in the homestays a bit further along. However, Thai Binh and Viet Hung guest houses, on the main street, both have good, cheap, clean rooms for budget travellers (around 200,000vnd). 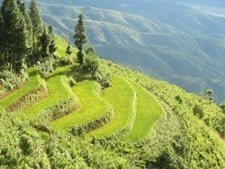 Or for smarter lodgings try the Mai Chau Valley View, Mai Chau Lodge and Khoa Thanh Hotel, all which are cosy, mid-range accommodations with views of the rice fields. 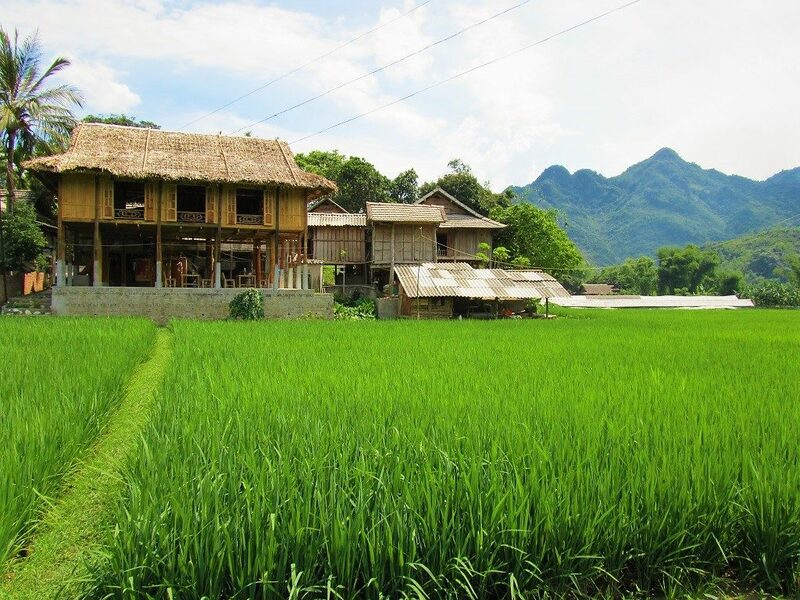 But what the vast majority of visitors to Mai Chau come here for is a night is one of the dozens of homestays in wood-and-thatch stilt huts above the rice paddy. These houses offer simple but comfortable accommodation (usually a mattress on the floor under a mosquito net), and good, home-cooked food. Bathrooms are clean with hot water showers. Many of the houses are owned by several of Vietnam’s 54 ethnic minority groups (in Mai Chau they are mostly White Thai). 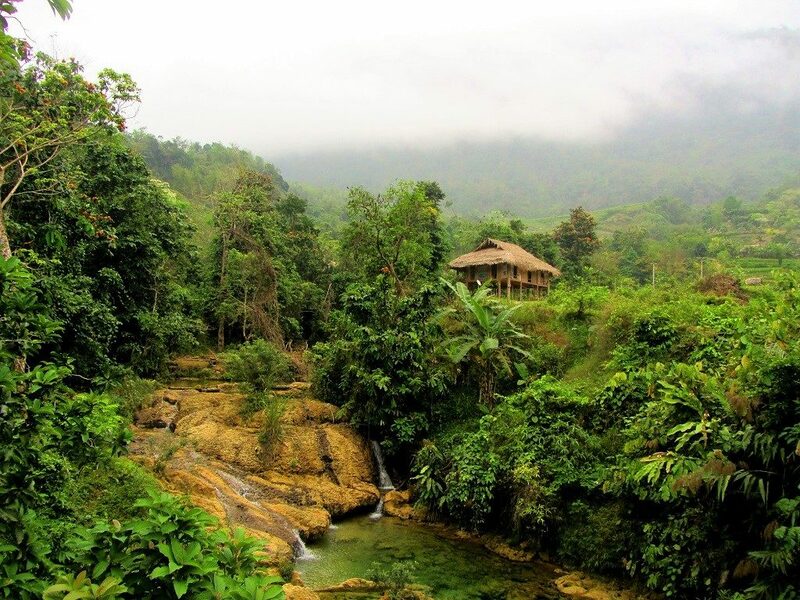 Mai Chau was one of the first places in Vietnam to introduce homestays with ethnic minorities. It’s been a huge success. 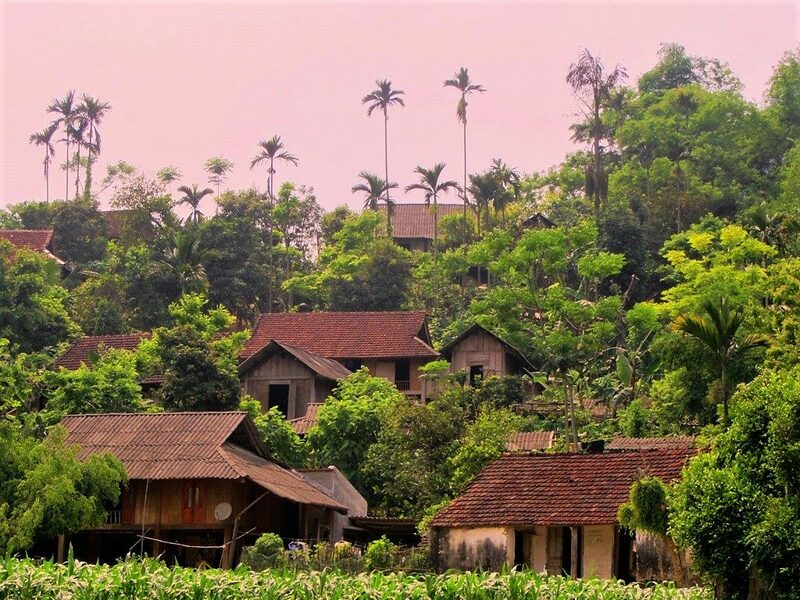 There are two main clusters of homestays, both of which are reached via pretty little lanes through the countryside just west of Mai Chau village. Poom Coong is the first of the homestay hamlets and is less touristy than the second hamlet, called Ban Lac (Lac Village). Indeed, Ban Lac has become a bit of a tourist trap of late, with trinkets and souvenirs for sale, signs in English for cold beer and Western food, and the scourge of saccharine pop and pounding techno music played during the day and night. Not that it isn’t still a worthwhile place to stay a night or two (especially Poom Coong). There are lots of excellent walks to be had in the surrounding countryside, the homestay hosts are very friendly and hospitable, their home-cooked food is extraordinary, and the price for room and board is very reasonable. Rates vary a bit and it’s always worth bargaining politely for a better price. 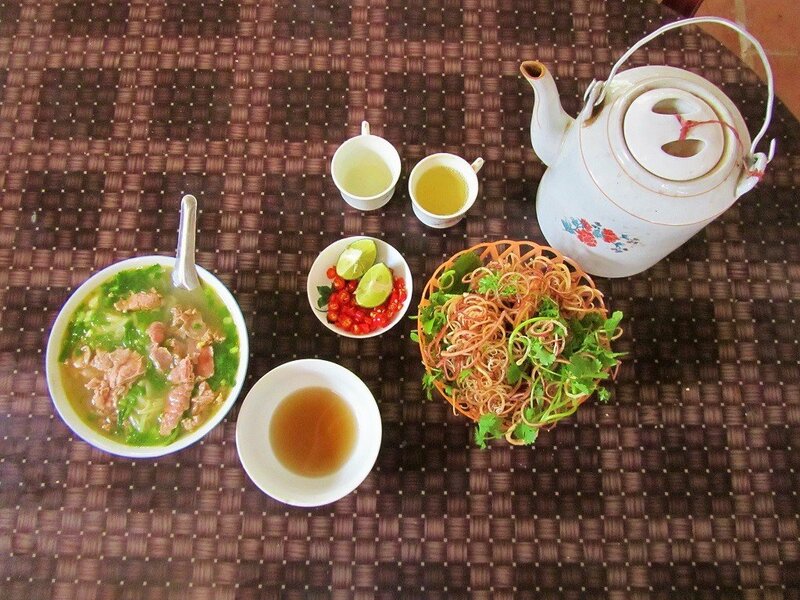 A night without any food is very cheap: from 60,000-80,000vnd ($3-$4). But you’d be mad to miss out on the food here, especially dinner, which can be anything between 100,000-200,000vnd ($5-$10) per person. The food is fresh, delicious and cooked over a wood fire. My last meal here was beef rolled in aromatic betel leaves, rice paddy crab spring rolls, green beans in garlic, silken tofu in tomato sauce, and fragrant steamed rice. Personally, I recommend staying in Poom Coong hamlet. My long-time favourite is No.8 Homestay, but Mai Chau Countryside Homestay and Mai Chau Sunset Boutique Hotel are also very nearby and very good. In Ban Lac hamlet, I would skip the main homestay drag and head a bit further along the lane. After crossing Lac Bridge, there are several quiet homestays on your left. As the homestay scene in this area has become more popular and more crowded, several higher-end, boutique and resort-style homestays have opened up in the surrounding countryside. These are much pricier, but they are very beautiful and romantic places to stay. Mai Chau Ecolodge and Sol Bungalows, for example, are little oases of greenery, and they appear to be relatively low-impact. You’ll be well-fed at your homestays, but for a ‘night out’, try the cocktails at the Mai Chau Sunset Bar. At night your homestay, leave the wooden windows open to catch the cool breeze off the rice paddies and lovely views at dawn. I’m always surprised at how noisy it is at night in the stilt houses: the humming of cicadas, the heavy rains hitting the rooftops, the throbbing chorus of frogs in the fields, the morning cockerel calls, dogs barking and babies crying, all before 5am – Saigon is quiet by comparison. From Mai Chau, head south on road QL15. Much of this road is either in the process of being widened and upgraded or is newly resurfaced, so expect some changeable road conditions. When I last rode it (2018), the section of QL15 between Mai Chau and the Co Luong intersection was desperately narrow and inadequate for the increasing volume of traffic and trucks loaded with bamboo that regularly ply it. I would imagine this will be widened soon, which will mean some disruption before things get better. The landscape, however, is lovely: passing along a pretty, rice-growing valley, hemmed in by limestone pillars. Just south of Mai Chau, there are a couple of good, short and enticing little side roads leading west off QL15. In particular, the route to Cun Pheo, where there are some homestays, is worthwhile if you have time. There are also a couple of good places to stay near road QL15: Mai Chau Villas is a mid-range resort with thatched bungalows, and Mai Chau Family Homestay is a wooden house on stilts run by a nice family. As you approach the Co Luong junction, road conditions deteriorate into dust, mud, and potholes. This is largely due to the trucks that ply this route, transporting bamboo to and from the bamboo factories on the banks of the Ma River. This might sound romantic, by the reality is just like another other big, industrial-scale business: dirty, polluted, appalling conditions, and ruinous to the local environment. The bamboo even smells revolting. Co Luong is a depressing little place, but the bad road doesn’t last for long and the crossroads here are the beginning of several excellent routes on this loop. For this section, we’re turning left (due southeast) just after the village, onto road QL15C which leads into a wonderland. 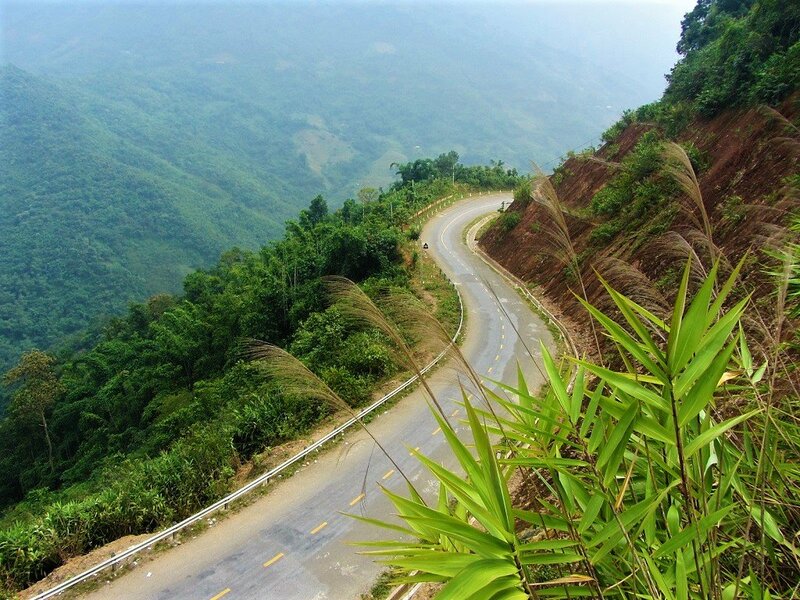 Road QL15C is a relatively new route that zig-zags its way up into the beautiful surrounds of Pu Luong Nature Reserve, an area that’s been rapidly gaining in popularity over the last few years, all the way to the other side at Canh Nang town. 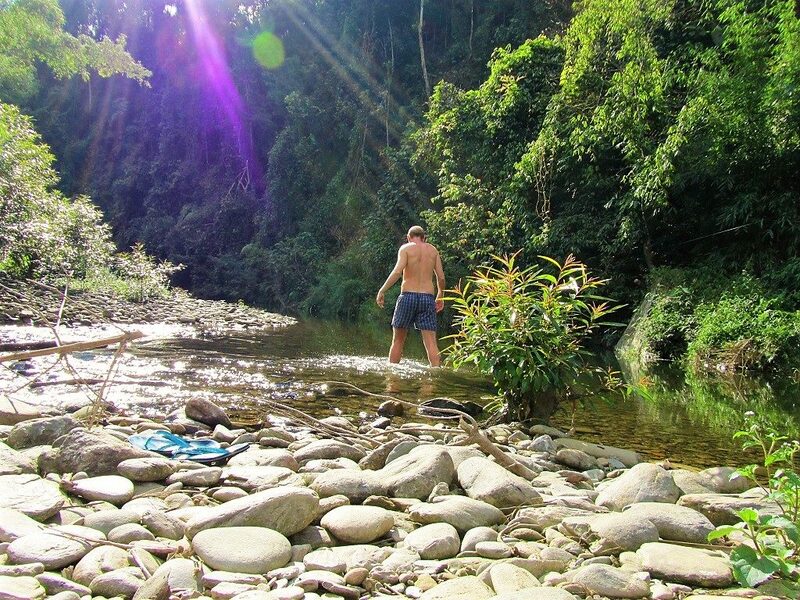 The nature reserve is located directly south and east of Mai Chau, situated around a tributary of the Mã River. It’s breathtaking scenery: the river is clear and rice fields continue right to the water’s edge; bamboo bridges cross streams and bamboo water wheels dip into the river, sending water down irrigation channels to the rice; small hamlets of wooden stilt houses cluster together on raised islands of earth in the middle of crop fields; when the land gets steeper the rice paddies are terraced and the houses become more dispersed, clinging to the hillsides; all around the valley, in a circle like a gigantic Stonehenge, are forested limestone pinnacles. The nature reserve is now easily accessible by motorbike thanks to paved and dirt lanes, and the area is dotted with homestay options in superbly-located stilt villages. 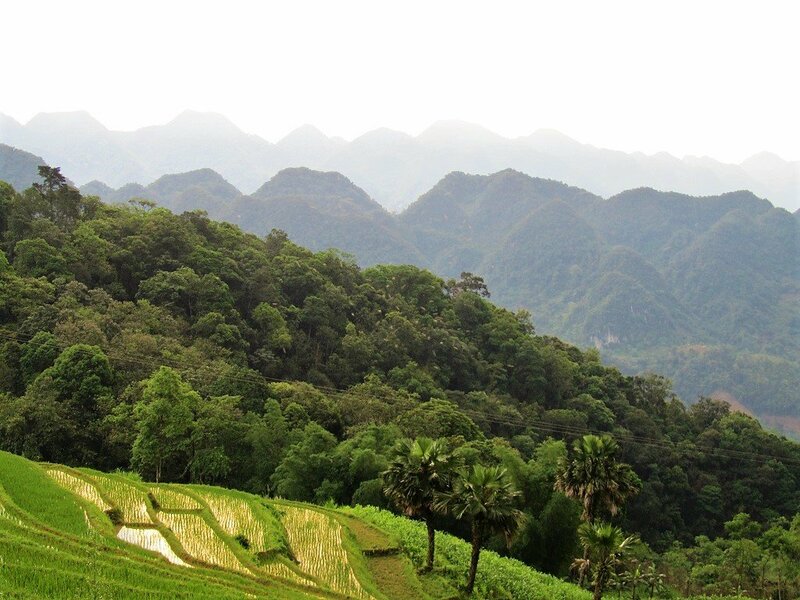 It’s far less touristy than Mai Chau, and this is the kind of landscape and living – where nature appears to be entirely benevolent, crops plentiful, concrete a rare sight, and people happy and hospitable – that most foreign travellers to rural Vietnam dream about but never find. Yet, here it is, only 150km or so from Hanoi. From the Co Luong turn off, road QL15C immediately climbs and then descends into a verdant valley, the hills covered in bamboo forests. By the roadside, you’ll see billboards with annotated maps of the nature reserve. This map is essential for getting to know your way around the reserve. It shows all the homestay areas, roads, pathways, rivers, wildlife spots, waterfalls and other places of interest. I’ve always found it very difficult to get my hands on a physical copy of the map, so instead I take a photo of the billboard and save the map to my phone so I’ll always have it as a reference and resource while in the reserve. 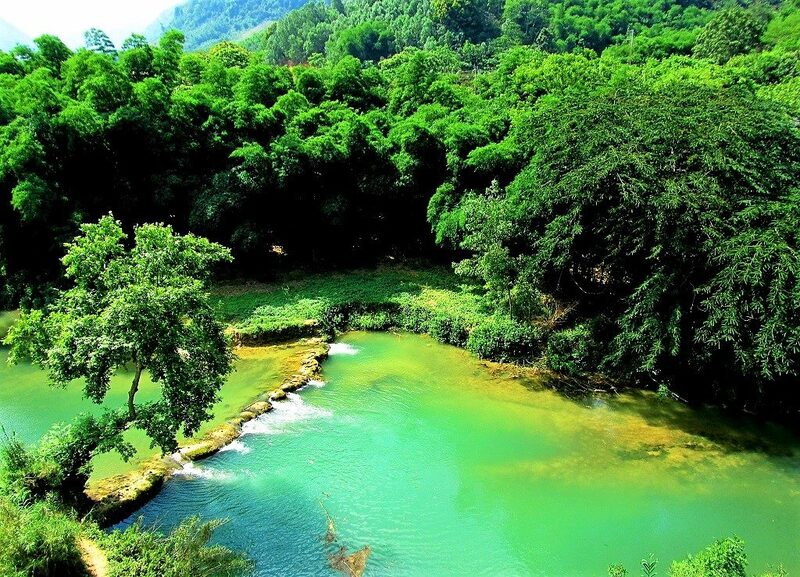 If you have time, you could spend many days ‘homestay hopping’ in Pu Luong Nature Reserve. Meandering uphill, the first cluster of homestays is at Ban Hang, a hamlet of wooden houses by the riverbank, which is accessed via a very steep side-road. There’s at least half a dozen homestays to choose from here, all of which are very cheap. There’s also a good hike to a nearby cave. Continuing on road QL15C, the forest cover increases as you push deeper and higher into the nature reserve: the views are sublime. At the top on the climb, the road plateaus, passing through a remote hamlet, before a narrow paved lane leads down to Kho Muong homestay area. However, the first accommodation is the boutique-style, very classy Puluong Retreat, which is one of several higher-end places in Vietnam that’s firmly the Instagram-Look-At-Me trail. It’s an absurdly scenic and tasteful place to stay, including the signature infinity pool overlooking the rice terraces (this is the Instagram bait that lures everyone in). 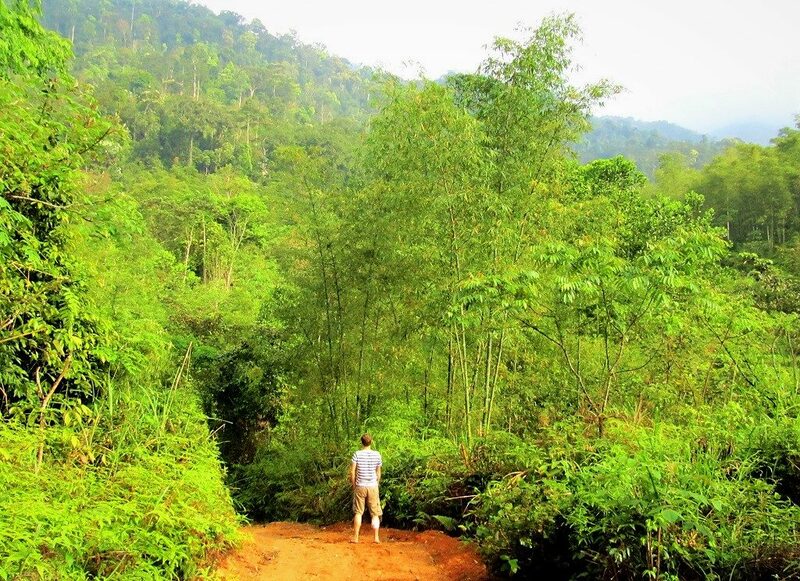 But continue down the lane into the valley and, as road conditions deteriorate, you’ll reach the homestays in Kho Muong village, in particular Pu Luong Treehouse and Rice Road Homestay. These two inexpensive wood-and-thatch stilt-house homestays are simply gorgeous. Make sure you stay here: you won’t regret it. The food is fabulous, the views are incredibly scenic, and the romance of the location and the accommodation is quite something. From Kho Muong, you can either continue on the lower, valley road to the Lang Tom intersection, or go back up to rejoin QL15C, which is the more scenic option. Either way, at the Lang Tom intersection you have a choice: continue straight ahead (due south) on QL15C to the forgettable town of Canh Nang at the edge of Pu Luong Nature Reserve, or turn left (due north) on several incredibly scenic (although of varying condition) back-roads to more homestays. If you choose the latter (and, time permitting, you should), continue north then bear right (due east) along increasingly muddy and treacherous roads to the remote homestays at Ban Hieu. A cluster of wooden homes perched on a steep hillside overlooking a jade-coloured waterfall that cascades down the mountain in terraces, collecting in deep, bathe-able pools, Ban Hieu is spectacularly located. It feels very off the beaten path, but, in fact, the homestays here are quite popular (especially with French travellers), and one of two are fairly high-end. Of the latter, Les Baines de Hieu Ecolodge and Ban Hieu Garden Lodge are really beautiful, boutiquey, atmospheric places to stay, but you’ll need to book ahead, and this is usually done through travel agents. However, there are several other, cheaper, simpler homestays in the area, too, like Mr Ba’s Homestay among others. The road (well, it’s a path, really) to Ban Hieu is due to be upgraded soon, which will cause a lot of disruption at first, but will then make access (and development) much easier. Back on the ‘main’ road heading due north there are a couple more one-way side-route options. Continue due north along a pretty valley to Lung Cao and the handful of basic homestays at Ban Nua, after which the road has long been blocked due to severe landslides. Or veer east onto an extraordinarily steep and fabulously scenic road that switchbacks up the mountains at an insane angle. It was misty when I rode it so my photos don’t do it justice, but trust me it’s amazing. When this road finally levels out it soars across an exposed plateau dotted with limestone outcrops and wooden hamlets. It’s a very surreal landscape and there’s a campsite (Pu Luong Camping), including hammocks, somewhere before hitting the intersection with road DT432A at Lung Van (unfortunately I don’t have the exact location on my map). At the Lung Van intersection you have some options: turn back the way you came or turn this side-route into a loop back to Mai Chau. For the latter there are two options, but only one is really viable. By heading due north at the Lung Van intersection you eventually hit Highway QL6 (AH13), which you can take back to Mai Chau. The other option is to turn left (due northwest) at the Lung Van intersection and follow the back-road DT432A until it too hits Highway QL6 back to Mai Chau. This is a very attractive option on the map, and indeed it’s also a very scenic ride, and a great little loop linking Pu Luong Nature Reserve with Mai Chau. But there’s one big problem: a very short section of this road (probably less that 1km) is in atrocious condition. In fact, for that 1km, it’s not really a road, it’s a bare section of sheer rock at a steep angle. It is ride-able if you have an appropriate bike – even I managed it on my automatic Nouvo, but it was extremely difficult and unless you have a lightweight off-road bike I can’t recommend it. Finally, at the southern entrance to Pu Luong Nature Reserve, road QL15C crosses a bridge over the Ma River, joining road QL217 and entering the town of Canh Nang. It’s not a very nice place and you’d be a million times better off staying the night in one of the excellent homestays inside the reserve, however, if for some reason you need a bed, Canh Nang has a couple of guest houses. Pu Luong Hostel is the best option, if not try Ngoc Thuy or Son Thuy guest houses, neither of which are much to shout about. 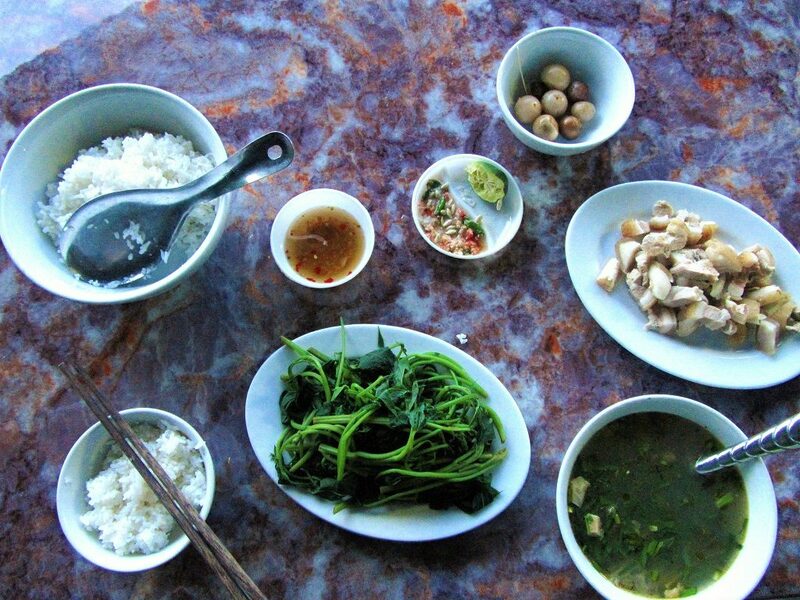 There are plenty of rice eateries (quán cơm) and gas stations on the town’s main drag. This section of the Limestone Loop in the most scenic and remote. Combining several good, mountainous roads spreading west of Pu Luong Nature Reserve towards the Lao border, I like to call this section the ‘Lao Loop’. It’s a long but gorgeous one- or two-day ride out to the Lao border on twisting mountain passes to Muong Lat, and then back again along the Ma River valley, before rejoining road QL15 near Mai Chau. It’s a long and sparsely populated ride, so leave early, bring some snacks and, if you want to spend two days riding it, bear in mind that there’s only really viable accommodation options at Quan Son and Muong Lat. You can also opt to ride a shorter ‘Laos Loop’ by taking road DT520 (marked in red on my map) back to join QL15, thus essentially cutting the distance of the loop by half. Most of the roads on the ‘Lao Loop’ are now in pretty good condition, but there are still some bad patches, and heavy rainfall can cause landslides which damage the roads. Exit Pu Luong Nature Reserve at Canh Nang town and head southwest on road QL217 as it briefly skirts the muddy banks of the Ma River before turning westward for Quan Son. Road QL217 meanders along river valleys and over forested mountains all the way to Quan Son town (where there are a couple of O.K nhà nghỉ guest houses) and on to the Lao border gate of Na Meo. As such, you may encounter some heavy goods vehicles plying between the two communist countries (including articulated trucks carrying gigantic pillars of hardwood from the Lao jungles), but in general the traffic is very light. The views are terrific and the riding is good. A ways after passing through the town of Quan Son, when things get more and more remote, a small road turns right (due north) along a picturesque valley. After passing isolated hamlets of wood-and-thatch homes, the road climbs a spectacular pass with an access road to Bo Cung Cave, which is definitely worth a visit. Rolling down the other side of the pass – the views are superb – you hit road DT520. Here you can turn right (due east) back to QL15 if you want to take the shorter route (marked in red on my map), but the most scenic option is to turn left (due west) onto DT520 towards Muong Lat. Recently upgraded, this is one of the best riding roads in Vietnam: there’s no traffic but the road is wide and in decent shape as it soars over jungle-clad mountains towards the landlocked nation of Laos. Muong Lat is a remote outpost that feels sleepy and attractive in good weather, but bleak and isolated in bad weather. There’s food, drink and a couple of guest houses here, including the adequate Song Ma Hotel. Something that I notice whenever I visit northern Vietnam is the presence of trà lá tươi and thuốc Lào (fresh leaf green tea and Lao tobacco). No cafe, eatery or restaurant is complete without a tea and tobacco station in the corner, which consists of a large, metallic teapot stuffed with local, fresh (not dried) tea leaves, a thermos of hot water, a dozen tiny teacups, a long bamboo pipe resting in a plastic bucket, a wooden box of Lao tobacco and a box of matches. Customers partake of tea and tobacco before and after a meal. All this is free; a part of the dining experience as essential as chopsticks and a bowl. People come and go freely (some not ordering any food) to share some tea and have a smoke and a chat before going about the rest of their day. I don’t smoke, so I can’t vouch for the special qualities of Lao tobacco, but it does smell good. The tea, however, is exceptional. I love all kinds of tea, but I’ve never had such a fragrant, citrusy, flowery tea as trà lá tươi. Once you get a taste for it you can smell the tea leaves all over the northern provinces. The distinctive aroma has come to define the north for me. All along the road to Muong Lat, there are waterfalls and rivers to cool off in, there are sublime views around every bend, there’s not a tourist in sight, and there are hardly any concrete buildings. After a long day riding the ‘Lao Loop’ it becomes quite dream-like. Lying in my bed in Muong Lat, I’m left with a kaleidoscope of colours, landscapes and rural life after spending the day wallowing in this fantastic corner of the country. In the early morning light, the valleys around Moung Lat look like a scene from a Chinese ink and water painting: full of crisp green rice paddies, bamboo growing along the river bank – their thin branches brushing the sparkling water – and limestone crags rising into the mist. Heading out of Muong Lat, a new bridge leads across the tea-coloured Ma River onto a small, paved road along its north bank. Small boats still navigate the sluggish waters: barges shift building materials upstream, and long bamboo rafts float silently along the current, heading downstream, where the rafts will be disassembled and the bamboo loaded onto trucks, bound for furniture factories in the Hanoi suburbs. I’ve always loved the Mã River. Its slow progress through the ancient limestone valley makes me think of the vastness of geological time. 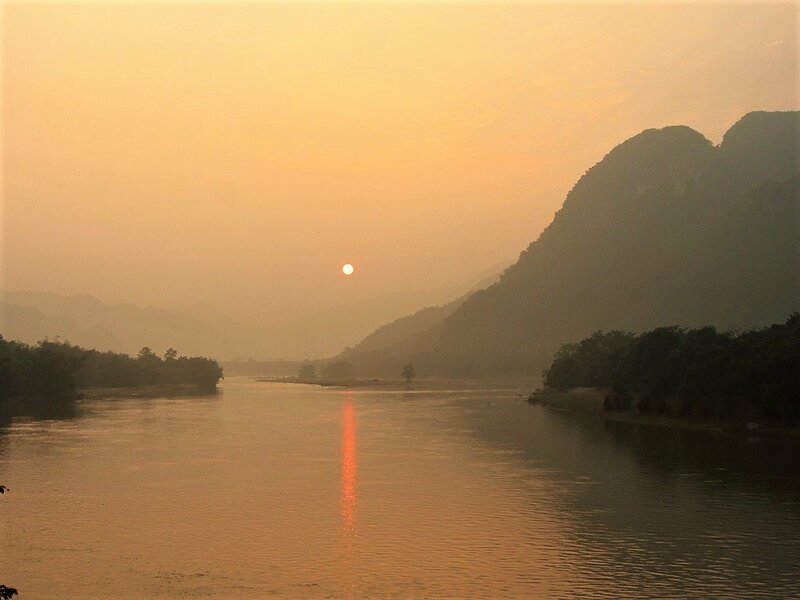 Research suggests that Mã means ‘Mother’, which seems fitting as the river has provided for some of the first known human beings in Vietnam, and later helped sustain the revered Bronze Age Dồng Sơn civilization. The Mã River was the ancient southern boundary of Vietnam, until the Vietnamese conquered the Kingdom of Champa and pushed further south. The maze of limestone pinnacles, which the river cuts through, has afforded shelter to many a guerrilla army, not only in the 20th century. The French, who called these mountains simply Calcaire (Limestone), had a hard time pacifying Vietnamese resistance here in the late 19th century. 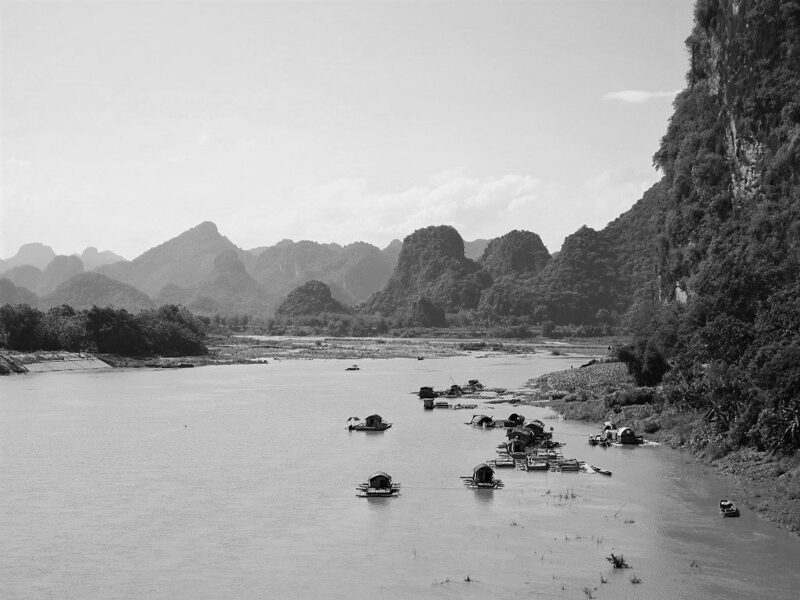 Even centuries before the French arrived in Vietnam, armies and emperors had been using the limestone peaks as a natural defence. One of Thanh Hóa’s most celebrated sons is Lê Lợi. Born in the late 14th century, Lê Lợi led a revolt against the Ming Chinese occupation of Vietnam from 1418-28. Lê Lợi was vastly outnumbered by Chinese forces, so he and his army practiced guerrilla tactics; ambushing Chinese troops and then retreating to the safety and cover of the Calcaire and the Mã River. In 1428, Lê Lợi defeated the Chinese and became emperor of Vietnam. Today, every town and city in the country has a road named after him. From Muong Lat, the bank-side road (of varying condition, but passable in dry weather) runs for over 70km, echoing the river’s course all the way back to the Co Luong junction on QL15. Here, the sluggish Mã River cuts its way through limestone pinnacles, its flow increasing in volume as clear-water tributaries run off forested mountains to meet it. There are a few small villages around the Mã Valley and many picturesque wooden hamlets belonging to ethnic minorities. This river is still at the centre of life, but these days it takes the form of giant hydroelectric dams, a couple of which are already in operation along the Ma River; a couple of others are currently under construction. Because of this, much of the river has been flooded, and the water level has risen by as much as 100ft. One result of this is that the original course of the riverside road has been elevated: the old one is now submerged. Google Maps hasn’t caught up with this change yet, but it still shouldn’t be difficult to follow the new road that winds along the Ma River back to QL15. Some of the villages that were originally settled in the Ma Valley have had to be relocated up the hillsides to avoid the flooding. These new settlements are dusty and feel like fairly unpleasant places. This is a landscape (and people) that is in a state of flux. At the Co Luong junction turn right (due south) onto QL15 towards Quan Hoa (also known and Hoi Xuan). Only 25km away, Quan Hóa has a few nhà nghỉ guest houses, including the Song Ma Hotel, located on QL15 as it passes through town. It’s fine for a night if you need to stop, and there’s a good local rice eatery directly opposite, called Sinh Hanh. 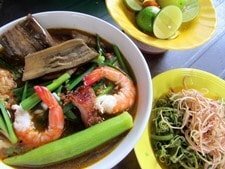 They do a good beef noodle soup (phở) for breakfast and, for dinner, dân tộc (ethnic minority) dishes, such as curried mountain goat meat (thịt dê núi) rolled in sesame seeds. Continue south on QL15, following the Ma River until it veers off into the forest, leaving the river behind. Some patches of this road can suffer from flooding after heaving rains, but, all being well, the town of Lang Chanh is only a half hour ride from Quan Hoa. I’ve always had a soft spot for this little town, although I can’t say why exactly. Set in a valley surrounded by bamboo forests, Lang Chanh is busy with rural commerce and there’s a spattering of O.K food and accommodation available, including the Chau Luong Guest House. On the main street there are a handful of local rice and noodle eateries that serve good, hearty dishes in an honest, rustic, no-frills environment. I tend to like this kind of thing and, years ago, I wandered into one of them on the 57th anniversary of the Vietnamese victory over the French at Dien Bien Phu, in 1954. The owners of the eatery were both octogenarians. Inside their beautiful house there was a whole dissertation’s worth of ‘Vietnamesia’: two wooden altars (one for ancestor worship, the other for a flat-screen TV), framed photographs of the couple alongside framed certificates from the Party congratulating them on their old age and various achievements in service of their country, and gaudy paintings of rural scenes from Chinese epic poems. But the star of the show was on the tea table where I sat down with the husband, whose name was Bình. As I leaned on the table to pour his artichoke tea, two plastic budgerigars started to tweet and peck from their position at the end of the table. Bình said it was a present from China. He tapped the table and they stopped chirping. I put the tea pot down on the table and they started up again. Bình had spent his life in the army. He’d fought the French, South Vietnamese, Americans, Cambodians and Chinese. He had 8 children, five of whom he said were ‘born at the wrong time’ and died in the war with South Vietnam and the U.S. When he fought at Dien Bien Phu, he was just 20 years old. Last time I was in Lang Chanh, I couldn’t find the couple, their home or their eatery. The countryside around Lang Chanh is very pretty and dramatic. Nearby, there are a couple of waterfalls located deep in the mountains and forests. It makes sense to base yourself in Lang Chanh for a night or two while making trips out to the waterfalls and getting lost on some of the back roads through the dense bamboo forests. The main waterfall is called Ma Hao. Try to avoid visiting on weekends when it can get rather crowded. Small dirt and paved roads lead deep into the bamboo forests, which cover most of the mountainsides in this area. These tracks are used for collecting wood and other forest resources, which are then either used locally or packed onto old Dodge-style trucks bound for factories and workshops. It’s well worth exploring some of these tracks, especially in the late afternoon when it can be magical. The first time I came to this area I took one of these paths just south of town. It was like entering Narnia: I could have been in any century since rice cultivation began here back in around 3000BCE. The only signs of the 21st century were a few motorbikes. The track took me right into the bamboo forests which stretched as far as I could see, along thick brown rivers, and through minority hamlets of stilt houses. There was absolute silence, yet whenever I stopped to take it all in, after a few seconds there was always some sign of human activity nearby – the echo of an axe chopping bamboo, a furl of smoke from within the forest, cow bells tolling as cattle were herded along a path, the splash of a fishing net. I found a spot to watch the sunset and brewed a coffee on my camp stove. The sun opened its eye and lit the underside of the clouds a mango-skin yellow. 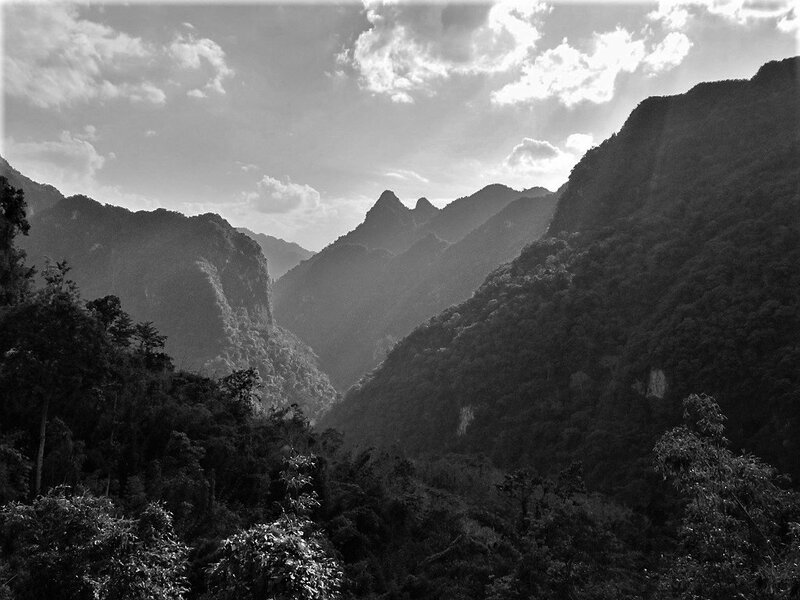 The light seeped through the diaphanous, delicate and endless bamboo forests, climbing over the mountains to Lao, ridge after ridge disappearing into the distance. Thunder rumbled from a storm that had skirted the town. From Lang Chanh, it’s only another 20km on road QL15 south to Ngoc Lac, where you hit the Ho Chi Minh Road heading north. From here it’s pretty much a straight shot all the way back to the Xuan Mai junction and then east into Hanoi, thus completing the Limestone Loop. However, there’s still some lovely countryside on QL15 to Ngoc Lac and more on the Ho Chi Minh Road, plus some bonus side routes to a couple of gorgeous waterfalls. After half an hour of pretty rural scenery on QL15, the Ho Chi Minh Road from Ngoc Lac is wide, fairly well maintained, and fast. The Ho Chi Minh Road has become famous among motorcyclists. 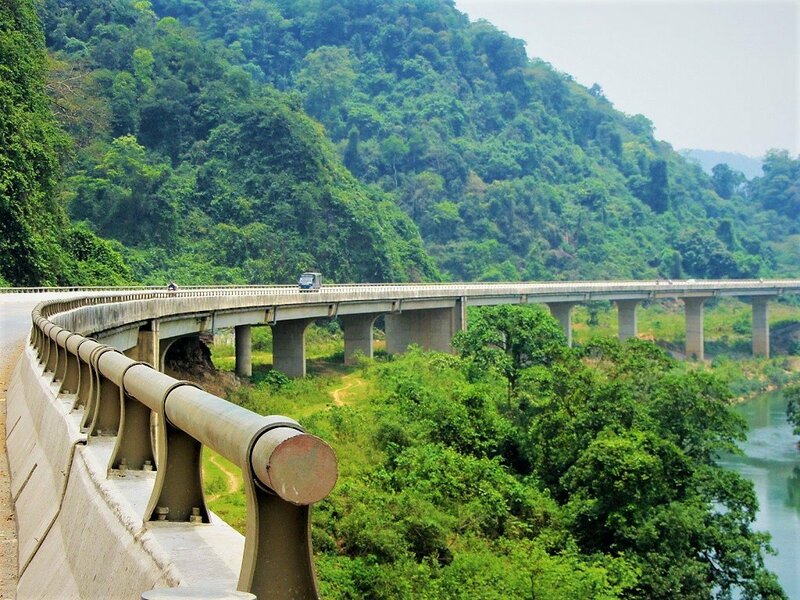 It’s one of Vietnam’s most ambitious engineering projects: the road runs nearly 2,000km north to south along the Trường Sơn mountain range, which is the ‘spine’ of Vietnam. Many sections of the road still see little traffic and much of it passes through some fantastic scenery. The first 50km north of Ngoc Lac is among the most scenic: it goes straight through Cuc Phuong National Park, threading through a jungle-clad limestone karst valley. There’s food and accommodation in Cam Thuy, including the Thanh Nhan Hotel, but I prefer to stay a bit further up the road, where the Ho Chi Minh Road cuts through a hill and enters Cuc Phuong National Park. Here the road follows the Bưởi River as it ploughs its way through limestone crags. It’s gorgeous scenery and the river looks very inviting, with a distinctive turquoise colour, which, as far as I know, is how the river got its name: bưởi means ‘pomelo’, a fruit with greenish-blue skin and flesh. Come between March and June for the best turquoise waters; after that the heavy rains start to turn the river a mud-brown. Quang Duc Homestay is a wooden guesthouse, located by the side of the Ho Chi Minh Road, with cheap rooms sleeping on mattresses on the floor. The food and drink is also very good. It’s located close to good swimming spots on the river. Take the narrow lane from the homestay along the small river heading west and you’ll reach May Waterfall, an impressive cascade down several levels of limestone, collecting is beautiful pools. Another great side route to an equally impressive waterfall is to head a bit further north of Quang Duc Homestay and turn west on QL12B, then join a back-road leading to Mu Waterfall, which is extremely photogenic. Quang Duc Homestay is a good place to base yourself while exploring the rivers and nearby waterfalls, but there are also some simple accommodation options at the falls themselves. On the Ho Chi Minh Road between Ngoc Lac and Cuc Phuong National Park, look out from signs by the roadside from nem chua Thanh Hóa. 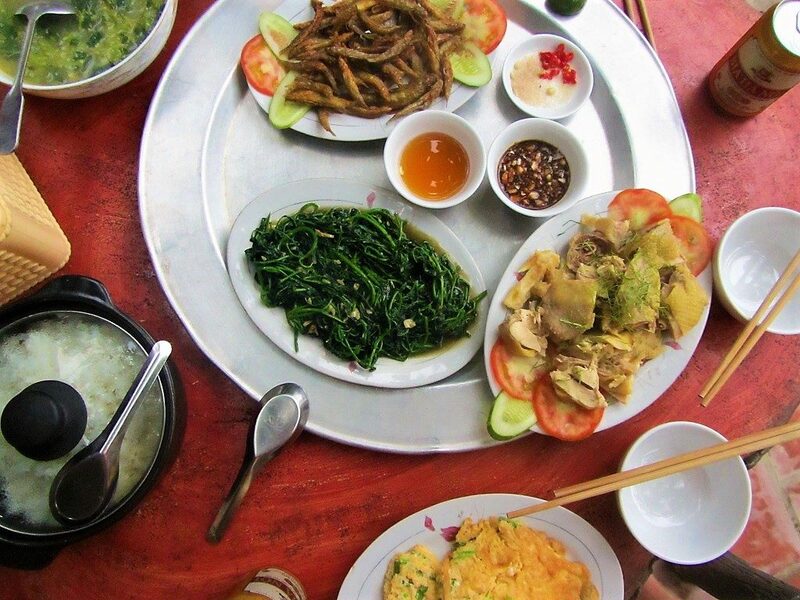 Thanh Hoa Province is one of a handful of places in Vietnam that’s famous for this delicacy. I had a hard time translating this for a friend who wanted to know what it was before eating it. I settled on ‘pork sashimi’. It may not sound appetizing, but this little snack is full of subtle flavours and very delicate. Nem chua is a kind of raw, cured pork patty, but that doesn’t do it justice. 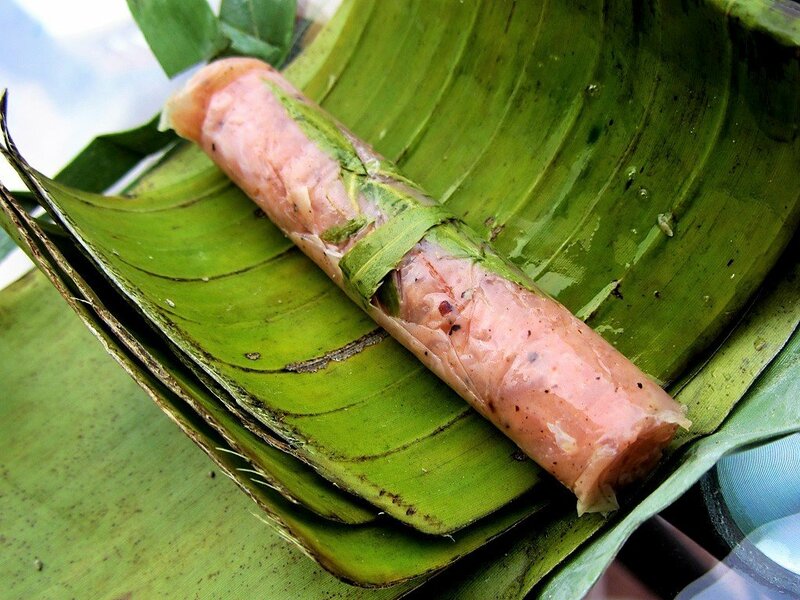 They come in small, bite-sized portions wrapped in banana leaves. The pink patty has a fragrant aroma of garlic and chilli. The flavours – sweet, sour, salty and spicy – combine with the smooth texture of the meat to make it very moreish. After you’ve had your fill of the waterfalls, rivers, and scenery around the national park, you could head east to Ninh Binh Province, which is a very popular travel destination. Personally, I find it too crowded, too kitsch, and too developed for my taste, and that’s why I prefer exploring Thanh Hoa Province over Ninh Binh. So I usually choose to take the Ho Chi Minh Road due north all the way to the Xuan Mai junction and Hoa Lac, and then turning east onto the Thang Long Expressway back into the capital. Sadly, at least an hour or two outside of Hanoi, the trucks, dust, and industrial estates start to reappear, making the ride fairly unpleasant, but there’s not much you can do about that. It seems incredible that small, peaceful hamlets of wood-and-tile homes on stilts, like the one pictured below, are so close to the urban sprawl of the capital: it’s just a couple of hours’ ride away. 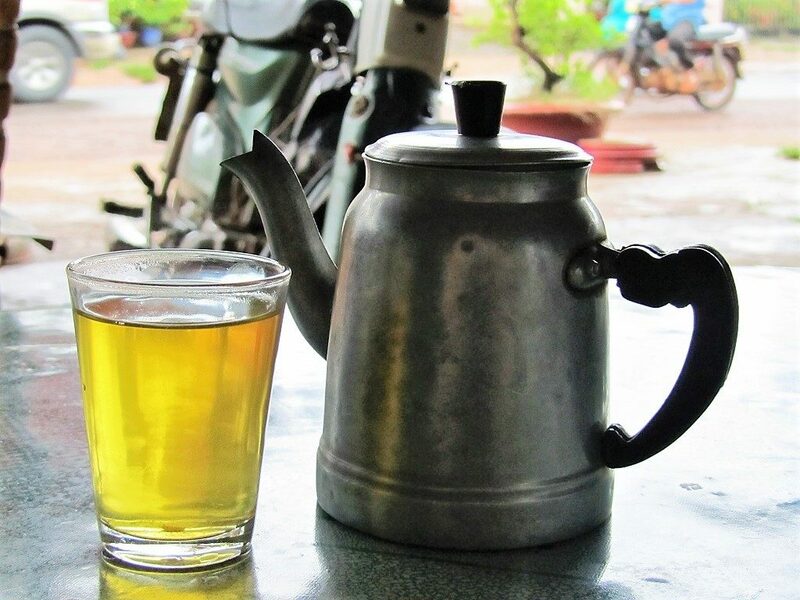 This entry was posted in ALL, MOTORBIKE GUIDES, Motorbike routes near Hanoi, Mountains, Northwest Motorbike Routes, The North and tagged guide, homestays, limestone, Mai Chau, motorbike, motorbiking, Pu Luong, route, Thanh Hoa, travel, Vietnam. Bookmark the permalink. Love your website. I used it to plan a cycling trip out of Mai Chau. Using your ‘Limestone Loop’ guide, I cycled the 60km from Mai Chau through Pu Luong nature reserve to Canh Nang. Then the next day rode 70km back to Mai Chau along the Ma River. An awesome ride, albeit with some challenging climbs, especially through the Pu Luong reserve. I’m now about the use your site for research for my next cycling trip to Vietnam. Thank you, it’s really great to hear that. I’m glad it was a good ride last time – but those climbs must have been pretty tough! Is there anyone who has driven a motorcycle from ninh binh / tam coc to mai chau / pu luong? Which path do you recommend? Do you have any tips for this trip? You could take road QL12B west towards Cuc Phuong National Park and then join road QL15 south and then west towards Pu Luong and Mai Chau. Although I don’t know what the current conditions of those roads are. This guide is awesome. I’ve been using for weeks here in Vietnam and it’s spot on and so helpful, thank you! I’ve just completed the lao loop, roads are in good condition, some minor dirt rock sections but a scooter can make it no problem. On the southern side of the loop the roads appear to be new and in great condition. I also did most of the routes inside the Pu Luong nature reserve, these roads were also in good condition, I think a scooter can make it no problem. That 1k section is a bit tricky…it’s definitely doable on a scooter, I did it on a Honda CRF250L, a larger dirt bike, it wasn’t too bad, just had to go slow. Finding the start of the trail was a little tricky, it looks like a foot path going to a home. I had to ask a local for some help, worked out. Thanks again for this guide!!!! Glad you made it. It was pretty hard work on a scooter, especially with three GIVI boxes attached 🙂 But my bike’s not designed for that kind of riding. I hope that little section gets paved some time, because it creates a nice scenic loop. Great to hear you’re enjoying riding this loop. And thank you for the updates. It’s good to know the roads are decent now. 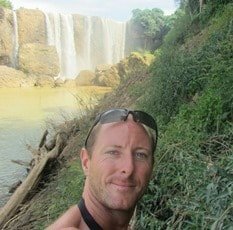 Hi Tom, thanks for all your awesome posts about exploring Vietnam. I’m planning a bike trip up around North Vietnam for a week early in the new year. I know the weather won’t be the best but was wondering which loop you think would be better: ‘the limestone loop’ or ‘the extreme northwest loop’? Also, please check the comments section at the bottom of both of those guides to see any feedback or updates that readers have contributed recently. Thanks for the great guide. I used this site a few years ago to do the ho chi minh road south to north. Since then i’ve moved out here and currently live out in Hai Phong. I’m thinking to make a trip out and do this loop, I just wondered if you knew a nice way out there from Hai Phong city that would avoid going into hanoi or spending too much time around container trucks…. Thanks again for the guide, it’s awesome. Good to hear you moved to Vietnam. I haven’t ridden between the Limestone Loop area and Hai Phong for years so I don’t have any good tips for that. But when I did do it, I just weaved a course on QL and DT roads between Cam Thuy and Hai Phong, sort of skirting Ninh Binh, Nam Dinh, and Thai Binh. You definitely don’t need to go all the way up to Hanoi to link up with the Limestone Loop. Some of those Red River Delta roads are busy with trucks but others are pretty nice – I just don’t have any current information on it. But let me know if you find a good route. Hi there, wonderful info I have to say big BRAVO for your efforts. I did 1300km last December from HCMC to Hue and loved it although the last bit was very wet. I am keen to follow the loop you mention from Hanoi between 17th December and 28th Dec. Is the weather very cold at that time there? I read it should not be too wet. Yes, it could be cold, especially on the high passes. It could also be wet, but probably not pouring rain; drizzle is quite common that time of year. It depends, really: if the sun is out, even in December, it can still be very nice and warm. First of all, Tom, thank you so much for all the ressources you provide on this blog. Then, as I am currently doing this loop, I would like to share my experience : Don’t take the road between “bản Chiềng Nưa” and “muong lat” except if you are a good driver liking challenges. It’s 15km of land, rock, sand- slides. Impossible to drive above 5km/h, only cycles can pass, it is impossible for cars. Sometimes it can be very dangerous. I wanted to do the “lao loop” in more or less one day, but I was so tired that i stopped in Muong Lat. Surprisingly, I think it is easier with a light motorbike rather a heavy one, like mine (honda xr). Thanks for the update. Fortunately there are two routes between Chieng Nua and Muong Lat: so if there are landslides on the road along the river, you can turn due south at Chieng Nua over a bridge across the river, which eventually links with road DT520 to Muong Lat. Sorry to hear that you had to change your travel plans because of the road conditions – the Lao Loop is always prone to landslides, unfortunately. Thanks for the update. Good to know it’s in decent condition. Hey Tom, really enjoyed reading all your guides to Vietnam. I am thinking of doing this loop in August, and wasn’t sure what the rain is like in the area. 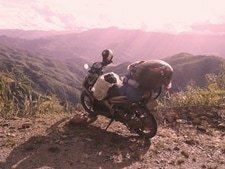 Do you know if I’d be able to rent a motorbike in Mai Chau and continue riding along the Lao pass? What are the road conditions like in the current weather? There have been some reports of bad road conditions on QL15 south of Mai Chau. In general, the roads in that region tend to suffer from landslides after heavy rain because they pass through such mountainous terrain, so there’s always the possibility of delays or sections of bad road surface. It’s best to be as flexible as possible. You should be able to rent a motorbike somewhere in Mai Chau – maybe from one of the homestays or hotels there. Please bear in mind that I am currently updating the text in this guide: the map is complete, but the information in the guide is still being updated and should be finished by the end of this week. Thanks for the quick response, and really appreciate you working on the update! Do you know if the road conditions up in the Ha Giang area over to Ma Pi Leng is better? I have ~5 days in the North, and would like to check out the areas outside of Ha Noi. 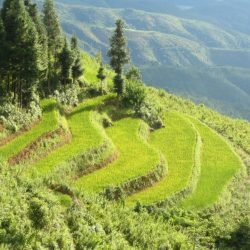 Again, it’s very difficult to know about the Ha Giang region. However, if anything, it is even more mountainous than the Limestone Loop, so if there’s been heavy rain it’s highly likely they’ll be landslides in places and some patches of muddy roads. It’s a general factor of motorbiking in the northern mountains, especially at this time of year. Your guides have gotten me from HCMC up to Phong Nha in one piece these past few weeks and I am so grateful, especially as a solo first-time rider! Thank you for all the work you continue to put into this incredible site. 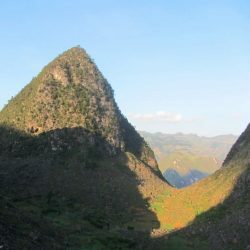 I was hoping you could give me some advice on how best to get up to Hà Giang from Phong Nha via part of the Limestone Loop. I’m thinking Phong Nha—Vinh—Thanh Hóa—Mai Châu—Yên Bái / Tuyên Quang—Hà Giang. For the bit between Thanh Hóa and Mai Châu, would you suggest going along the river on QL15 or through the reserve on QL15C if I only had time for one? If you have any recommendations on the entire route or better cities to stopover in, that would be much appreciated as well! Many thanks in advance. 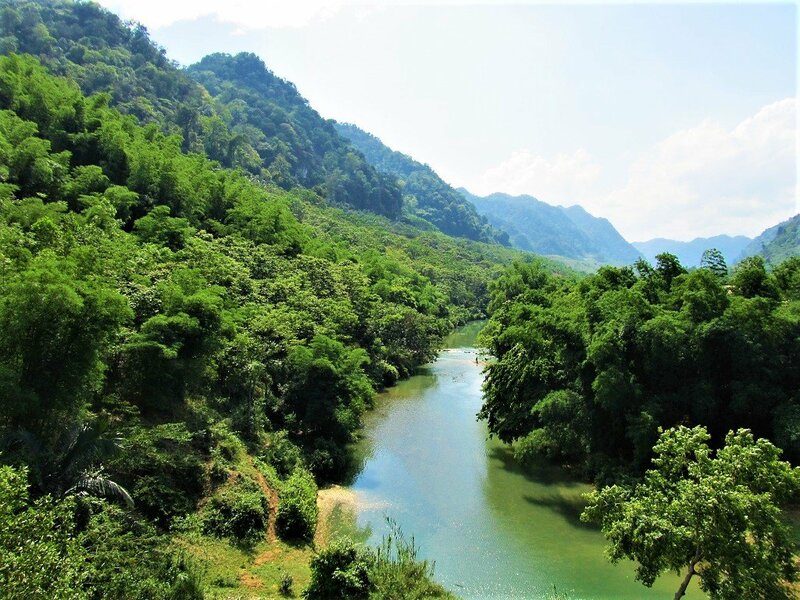 From Phong Nha continue due north on the Ho Chi Minh Road all the way to Ngoc Lac or Cam Thuy (don’t go to Vinh along the coast) – see sections 6 & 7 of this guide. Then turn west off the Ho Chi Minh Road toward Pu Luong Nature Reserve on either QL15 or QL217. The take QL15C from Canh Nang through Pu Luong which is a beautiful ride. 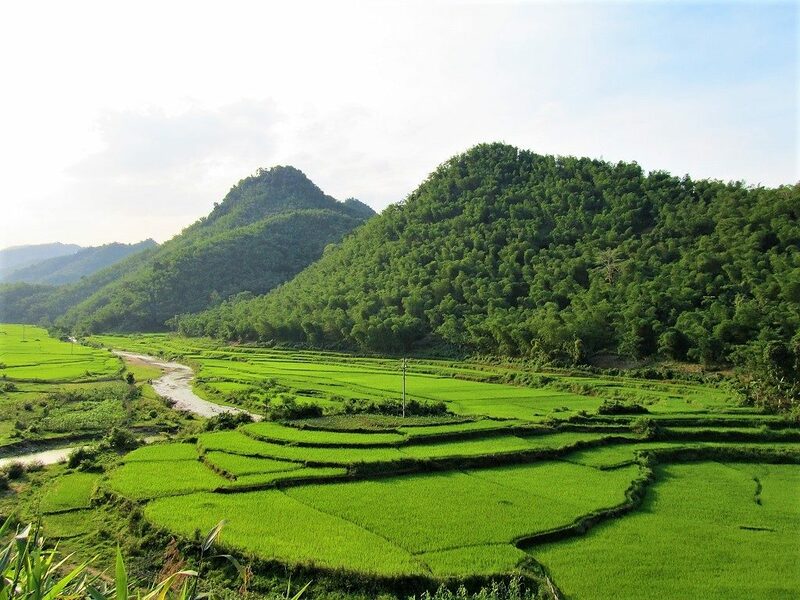 From Mai Chau you’ll need to take QL6 to Hoa Binh and then head north towards Phu Tho and Tuyen Quang to join QL2 to Ha Giang – that’s a long ride but it’s worth it to get to the Extreme North Loop. What’s the state of the full Lao Loop at the moment? Last year some people were complaining about the DT520 being bad. 520 is excellent now – they’ve finished repaving the whole road and it’s great fun to ride. I’m in the process of updating this guide right now, and I’m planning to modify (or at least offer as an alternative route) the Lao Loop so that it starts from Quan Hoa and follows 520 all the way to Muong Lat then looping back towards Mai Chau on the currently unnamed road following the Nam Ma River. The latter is good for roughly 90% of the way back to QL15, but there are still a couple of sections that are bad due to dam and road construction. In good weather it should be fine to ride. Ah, thanks for the update on the loop! Might try to do both versions of the it and end up doing the really scenic section of the 520 from both directions. Another thing I was wondering was if there are still cheap priced homestays in the nature reserve. Seems like the ones you’ve mentioned in the guide became popular and increased prices to fit demand. Will I still find a 200,000 sleep and eat spot around Ban Hieu or somewhere equally scenic? Yes, there are still plenty of cheap homestays in Pu Luong – near Ban Hieu and all over the nature reserve. You’ll see the homestay maps on billboards as you ride through the park. We’re back home now and have had an awesome trip through Vietnam.Thank you so much for your guides, it really helped us planning. We started in Hanoi and drove all the way to Hoi An usuing the Ho Chi minh highway. I want to give some updates regarding the status of the differents roads we took. Hanoi to Mai chau we followed section one from the limestoneloop. First part was quite crowded and busy(leaving Hanoi). The further we went the less trafic we saw. Some busy parts, but most of the road was pretty nice to drive. Mai Chai to Tam coc: Straight through Pu Luong (road CL15C). Great road to drive with an average pace of 40 km/h+. After CL15C we took CL217, which was a nice road to drive), to the east driving to CL12B. CL12B was the worst road we’ve seen on the entire trip. Loads of constructions, dust everywhere, full of trucks, people should avoid this route if possible. The last bit we took AH1 to Tam Coc. The entire day took us from 9AM to 5 PM+-. Tam Coc to Phong Nha: Took AH1 all the way to Thanh Hoa (+-1hour drive). From Thanh Hoa we took CL47 untill we reached the Ho Chi Minh highway again. CL47 was a really nice route to drive. Roads we’re quite empty, in really good condition and plenty of good looking parts. Would surely recommend this route. Rest of the road is known and just like your guide. All well paved roads and perfect to drive. The part from Phong Nha to Khe sanh was absolutely the best part of our entire motortrip. Would recommend it for sure. I think it will be best to not drive this part alone, because somethimes you won’t see anyone for hours. We brought some extra fuel, but did not need it. So once again, thanks for all your information! Great to hear that you had a good time on your road trip. Thank you for the updates. Sorry to hear about road QL12B, but QL47 sounds like a good and interesting ride. 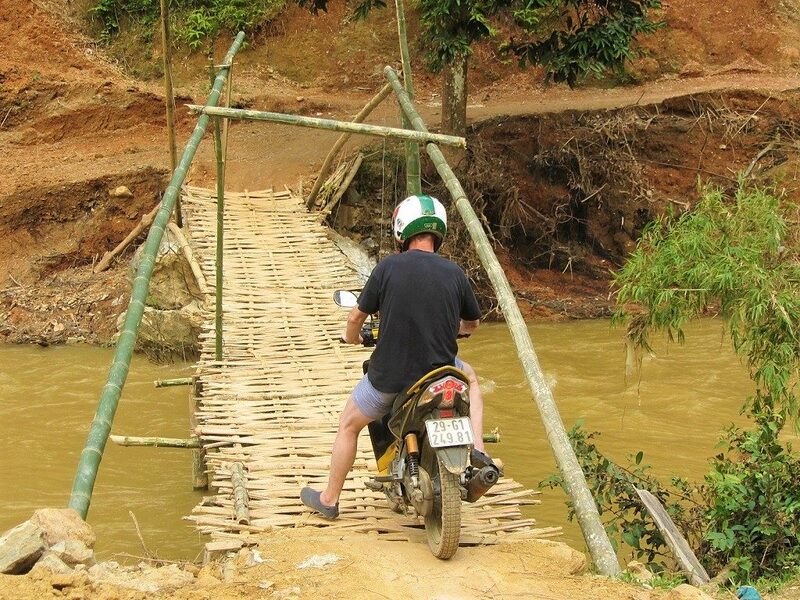 Yes, I agree about the section between Phong Nha and Khe Sanh – incredible ride. Hi Tom, first of all thank you so much for this website; I did to Tomb Rider route today and it was fantastic :-). Quick question: in few days I’ll be in Ninh Binh and then I was thinking of doing the first part of the loop (in reverse) by driving through the QL15c and then up to Hanoi via Mai Chau. From Ninh Binh G-maps is suggesting to take the QL45 then the QL217: do you have any update regarding the road conditions ? (Especially of the latter…). I last rode QL45 a long time ago – back then it was fine back pretty potholed. I would imagine they’ve upgraded it since then, but if they haven’t it would be a fairly bumpy ride. QL217 up to the Ho Chi Minh Road was OK last time I rode it, but again some potholes. However, I would hope they’ve repaved that too by now. After crossing the Ho Chi Minh Road, QL217 was undergoing repairs last time I was there (October 2017). If you want to avoid that, you can take QL15 instead. QL15C through the park is still good, and then joining QL15 to Mai Chau is fine, but there’s one horrible bit just after you join from QL15C as it meets the Ma River. If you do this ride, any updates you can send would be much appreciated. first of all thanks so much for this awesome website. It makes it possible for a less experienced rider like me to still make this very special travel experience. I am loving it! May I ask for one more advice? Do you have recommendations on which roads would be best to connect the Limestone Loop and the area around Sapa? 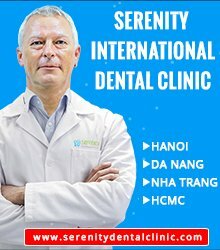 I would like to avoid going into Hanoi or its suburbs. 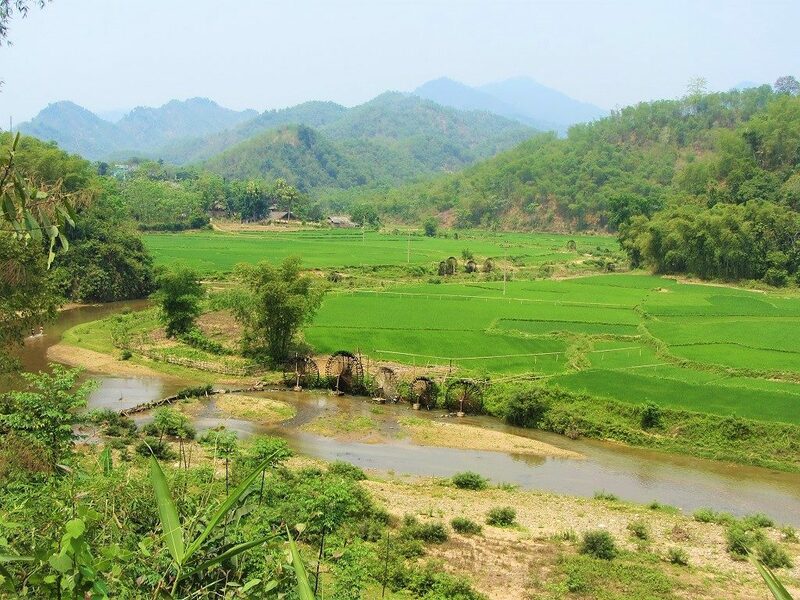 Yes, there are several ways to connect Mai Chau with the Sapa area, but the most direct and reliable are either QL6 (AH13) via Son La and Dien Bien Phu, or cutting across on QL37 to meet QL32 up to Sapa via Nghia Lo. Either way it’s a pretty long ride (at least two days), but these are the roads that are generally in good condition. There are many other options – criss-crossing between these two main roads – but road conditions are notoriously unreliable. Please bear in mind that the Limestone Loop guide on this page is due an update, which I’m currently in the process of doing. Do you know if there are accomodations along that route? Or would I have to plan my daily rides regarding to where I will find a bed for the night? There are local guest houses (nha nghi) in all the towns on those roads – for more about nha nghi see this. There probably is a local public bus between Mai Chau and Canh Nang/Ba Thuoc (close to Pu Luong Nature Reserve), but I doubt it takes road QL15C, which is the one that goes straight through the park. 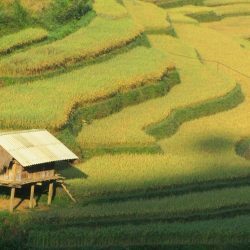 However, it’s probably quite easy to arrange transportation in Mai Chau yourself: for example, a local motorbike taxi (xe ôm), or at least your hosts in Mai Chau homestays will be able to suggest means to get to Pu Luong. 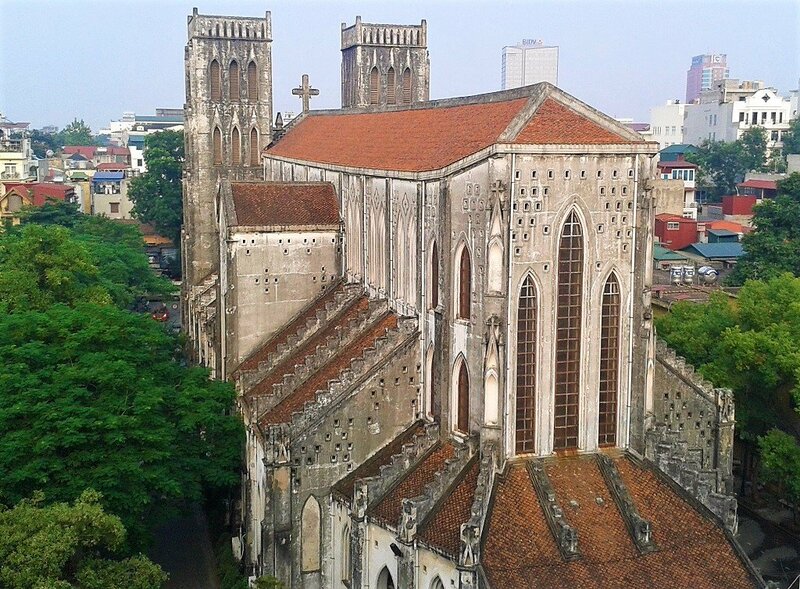 I fly into Hanoi early on March 9, I’ll leave Hanoi late on March 25th. I will try to do most of the Limestone Loop clockwise and then connect from MAI CHÂU to Sìn Hồ, where I will do a conglomerate of your different routes. What’s the best route from MAI CHÂU to Sìn Hồ? Please note that I’m currently updating the Limestone Loop guide. There are some changes: for example, road QL15C through Pu Luong Nature Reserve is complete and a very beautiful ride. From Mai Chau to Sin Ho there are many different combinations of roads to take. Two nice routes are: Road QL6 to Nga Ba Co Noi then turning east on road QL37 all the way until it joins QL32 and take that all the way until it meets QL4D at Binh Lu. Or continue on road QL6 from Mai Chau all the way to Muong Lay, or cut across on roads DT106 or QL279 to meet QL32 to Binh Lu. However, road conditions can be a problem in the northwest. Of these routes, the first one (via QL37) and the second one (via QL6) are usually the best in terms of road quality, but there’s no guarantee. The more time you have for these routes the better. Perfect, sounds like there aren’t too many ways to go wrong. Thanks for the response Tom. Your website is very impressive and full of insight. In a few months, a friend and I are going to spend 35 days riding the country from South to North. I watched a video recently from Tigit motorbikes where it was recommended to take the train from Dong Hoi up to Hanoi because the riding was not very great. 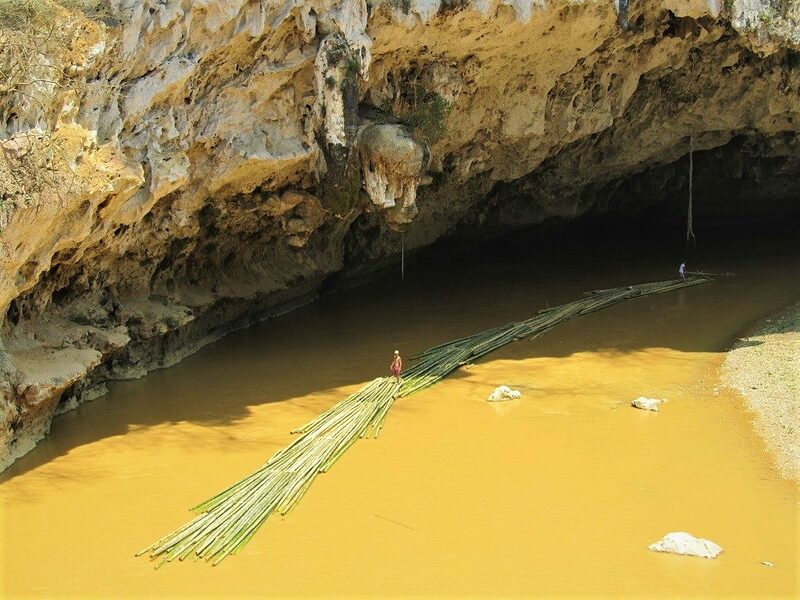 This limestone loop seems to suggest otherwise (as well as the 100 km from Phong Nha to Pheo). If we do opt to ride into Hanoi rather than take the train, which section of the limestone loop do you recommend riding (assuming we could only choose one part), the western half or the eastern half? I was leaning towards the western half since it would allow us to possibly ride the “Lao Loop” as well. I wanted to hear your suggestions because its clear that you are quite knowledgeable about riding throughout the country. In your opinion is there anything from this part of the country that absolutely must not be missed? (with regard to beautiful scenery and fun roads) Thanks from a fellow motorcycle and travel enthusiast from Minnesota. As long as you have the time there is plenty of good riding between Dong Hoi and Hanoi. In particular, as you say, the ride from Phong Nha to Pheo is superb. After that stay on the Ho Chi Minh Road all the way to Ngoc Lac or Cam Thuy, which is a very agricultural, lush, easy, smooth ride, although not spectacular scenery (unless you turn off west on Road QL7A towards Con Cuong and Pu Mat National Park, but that’s going a bit out of the way). There’s also the possibility of taking one of the boats around the ‘floating’ tea plantations (Doi Che Bac Son Thanh An) in Nghe An Province before reaching the intersection with Road QL7A – it’s just a short side trip. The Limestone Loop is great – very scenic and some good riding roads. I was there recently and am now updating this guide, including the route: it should be finished before you arrive in Vietnam. But in general, the best roads are QL15C and DT520. After that you can either continue on the loop to Mai Chau and hit Highway QL6 back toward Hanoi (the first part out from Mai Chau is scenic) or loop back to the Ho Chi Minh Road to Hanoi instead (the section from Cam Thuy to around the Perfume Pagoda is great), but inevitably the last hour or so into Hanoi on either route is grim. First of all I want to thank you for the informaton you’ve provided on your website. It’s extremely helpfull for planning my motorbike trip with a friend. We want to do a trip from Hanoi to Hoi An. We don’t want to take highway 1, but want to take some nice routes. Starting from Hanoi we will take section 1, then we will take section 2. After section 2 we will drive to Tam Coc using CL217 and CL45. We want to make a stop in Tam Coc for 2 nights (1 full day). After Tam Coc we will drive from Tam Coc to Phong Nha, using the Ho Chi Minh Highway. In Phong Nha we will explore some caves and will stay a total of 2 nights probably (1 full day). From thereon we will drive to Hue, where we will sleep for 1 night. After Hue we will go to Hoi An using th Hai van Pass. Finish in Hoi An. We got a total of 10 days to go from Hanoi to Hoi An. We got a total of 8 days on the motor, and 2 days where we will not drive at all (1 day in tam coc and 1 day in Phong Nha). We’re quite experienced drivers and wil have solid bikes from Tigit Motorbikes, which should save us some time. The planning is a bit thight, im fully aware of it, but we want to see as much as possible and don’t take highway 1. Do you think my suggested route is possible? Do you have any suggestions to improve our plan? I think your itinerary is fine, but you might be pushed for time, especially is anything doesn’t go according to plan – which often happens on these trips: for example, a section of road that’s in bad condition which slows you down, or bad weather etc. 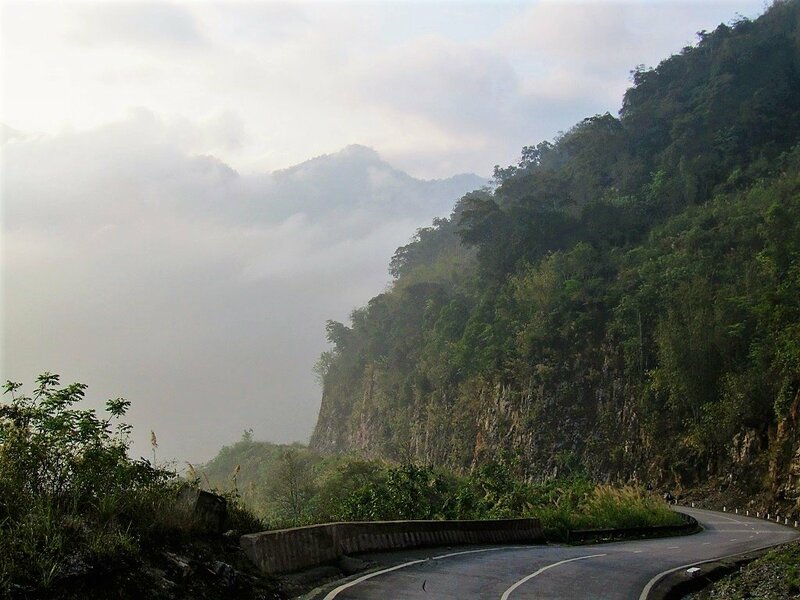 For the first two sections to Pu Luong Nature Reserve, from Mai Chau to Canh Nang take road QL15C straight through the nature reserve – it’s a wonderfully scenic ride and the road is in decent condition now. Please note that I’m in the process of updating my Limestone Loop guide so some of the information may change. From Pu Luong to Tam Coc, QL217 was quite rough last time I rode it, and I’m not sure of the condition of QL45. If you do take these roads if you could please let me know of any updates on their condition that would be great. From Tam Coc to Phong Nha is a very long drive (around 500km) for one day. It’s a much better idea to drive it in two. From Phong Nha to Hue in one day is fine, and also Hue to Hoi An. I assume, if you want to avoid Highway 1, you will be following the Tomb Rider and Hai Van Pass guides, in reverse of course. Thanks for your reply Tom. We will go in march, so let’s hope the weather will be good to us. I will let you know what the road conditions are. When will your updated guide be availible? Thanks for the tomb rider guide tip. The Ho Chi Minh highway close to the Laos boarder is the road i had in mind. We will drive from Phong Nha to Khe Sanh, depending on the time we will sleep in Khe Sanh and then continue to Hue. Or do you think the Tomb Rider route is better? I have all the new information from a recent trip for the Limestone Loop, I’m just trying to get other things finished before I write the full update for that guide. But I don’t know exactly when that will be – hopefully within a month. Thanks for the reply once again. Depending on our timeschedule we will choose between the Tomb Rider route or the hcm highway. Last question: Do you think it is possible to drive from Mai Chau to Tam coc in 1 day? Going the route I talked earlier about? And assuming the weather will be good to us? Yes, it should be possible to ride that in one day. However, it does depends on road conditions and weather, but the distance (it’s under 200km) is not too far for one day – it’s still a good idea to leave at a decent time in the morning so that you have plenty of time to get there. Thanks for the web site and nice road to explore! I just came back from a part of the Limestone Loop. Pu Luong is amazing, but the road at the moment are in very bad condition because if the rain. The main road is fine, but the dirt track are a nightmare. On the way to Ban Hieu, it’s really muddy and extremly slippery. A part of the road just felt in the River. They are building a small bamboo bridge that I guess should be temporary to cross the River. Vietnameses guys told me I was crazy to try to get there and in fact, with those condition, if was almost true! Finally, I didnt slept there, the price were too high… (Mr. Si ask for 400 000 D. Without dinner for a room in is niece house). With the heavy rain of yesterday night, I don’t think it would have been possible to drive back today. In Quan Hoa, at Nha Nghi Song Ma, the lady was asking 300 000 D for the night, which I think it was pricey. I went just the road next to the gas station and find a ok place for 150 000 D.
So I hope those informations will help the people that are on their way there! Thanks very much for sharing your experience on this route – the road and price updates are very valuable information for me and for other readers. Sorry to hear about the bad weather conditions – it sounds like very difficult riding conditions. Hi Marie-France! Thanks for the details. 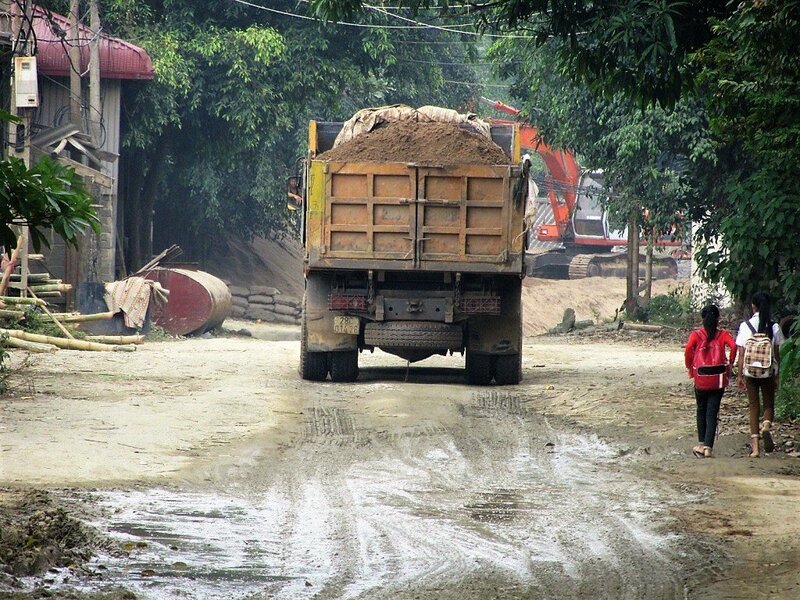 May I ask if the “main” road of Pu Luong is paved or is it also mud? I’ll be there in 2 weeks and all I’ll have is a scooter. My route goes from Mai Chau to Puluong Retreat. Followed your advice and branched out of the HCM road to go through Pu Luong nature reserve. Wow ! The ql15c is in ok shape on some parts, terrible in others. But the scenery was amazing ! I think this might be my favorite ride so far since leaving Saigon. Thanks so much for the advice i would never have taken this road otherwise ! Great! Yes, Pu Luong is gorgeous. Thanks for the updates on the condition of QL15 – that’s very helpful. I forgot to give an advice for the people who wants to spend one night in Lang Chanh with a tight budget in my last post. We wanted to stay at Chau Luong Homestay, but the girl at the reception asked 400 000 vnd for one night for a room. We thought it was very expensive and we tried to negociate the price without success. So, we decided to find another place for the night and we found a decent Nha Nghi located on the south road. As you leave the town, turn right just after the bridge. The price for one night is only 150 000 vnd and the owner is really friendly. He offered us jack fruit, tea and rice wine. The name is Nham Tuyet Nha Nghi and it is located near the rice field, good for an evening walk to meet (very friendly) people in the villages around after a long motorbike ride. We did the limestone loop last week. We really enjoyed that trip. The scenery is gorgeous and impressive all along the way. We took six days to do it and I think it’s a perfect time to discover this region. I just want to notice that the road along the Ma river is a mess due to the traffic, there are a lot of trucks, and the road conditions are very bad sometimes. The Lao loop is amazing, but the first part of the trip is a nightmare. The road DT 520 is under construction (over almost 20km) and sometimes is very difficult to drive with a scooter because of stones and mudd. So, you can’t really enjoy the scenery. I hope it can be helpful for next travellers. Thank you again Tom to share your trips, because we really enjoyed this one. We have discovered a new beautiful area in Vietnam. Thanks, it’s great to hear that you enjoyed your trip. It is a beautiful area, indeed. And thank you for the valuable road updates – I’m sure that will be very helpful to other readers who are thinking about riding this route. I hope they finish upgrading the roads soon. Hi Tom, i am thinking to make this loop in combination with Ninh binh an 2 days ha long …. how many days would we need for that starting from hanoi ? You could spend anything from 2-5 days on the Limestone Loop. But you could easily shorten it by cutting out the ‘Lao Loop’ section of the route. Me and my friend are going to do the limestone loop tomorrow, we are coming south from tan ky and intend to do it backwards from the ho chi Minh road but once we get to point B head south to vinh for a day or two and then into Hanoi, i have downloaded your maps but i noticed on the overall map there aren’t the hotel locations etc, you wouldn’t have all the different section maps with the hotels and attractions on would you ? Just because we are doing it backwards and from a mid point. No, I’m sorry I don’t. But you shouldn’t have too much of a problem finding places to stay in the main towns along the Limestone Loop, especially in nhà nghỉ (local guesthouses). Also, please bear in mind that this guide is due an update, so I can’t guarantee that all the information will be accurate. Hi, Tom. I can’t open the Limestone Loop maps. I can see them on the webpage but they won’t open with the app. I tried with two different deviced. Is it just me? Thanks! That’s strange. It works OK with me. If you have another device, try that. It is just a simple link to Google Maps, so it should open in a new window. I will be coming to Vietnam next week for the sixth time. This time with my 9 years old daughter for 12 days. North only. We plan to go to either Yen Bai or Ha Giang and also Mai Chau. How is the roads condition these days? Do u think Tom, that once we’re in Mau Chau, we can rent a motorbike and wander all the way to Moc Chau and find a place to sleep there (we’d love to skip advanced booking). Road conditions are pretty good now in Mai Chau and Ha Giang. Last time I was in Yen Bai, some roads surfaces were not great, but perhaps they’ve been repaved by now. However, because it’s the rainy season, if there’s been heavy rains in the mountains, landslides are common and can block roads for hours. So just keep an eye on the weather. Yes, you should be able to rent a bike from Mai Chau. But you may have to negotiate for a while in order to keep it for an overnight trip up to Moc Chau. In general, you should be able to do it by leaving a copy of your passport and visa, and maybe also some collateral. Thanks Tom. How long is it from Hanoi to Mai Chau, public transport? Different sites say anything between 2.5 to 4.5 hours. Have been really enjoying your website. I’ve actually been reading with the intention of cycling one of these routes. The Limestone route is of particular interest. I’m looking at riding late December/early January. Can you suggest if this is a good idea? I am wondering how intense the elevation will be and whether the weather will be manageable at this time of the year (and also be good for scenery) Thanks for your time! Well, winter isn’t a great time for that loop because the temperatures can get quite low – especially on the mountain passes. And there’s often a mist and little rain hanging around. But there are also nice days too, of course. 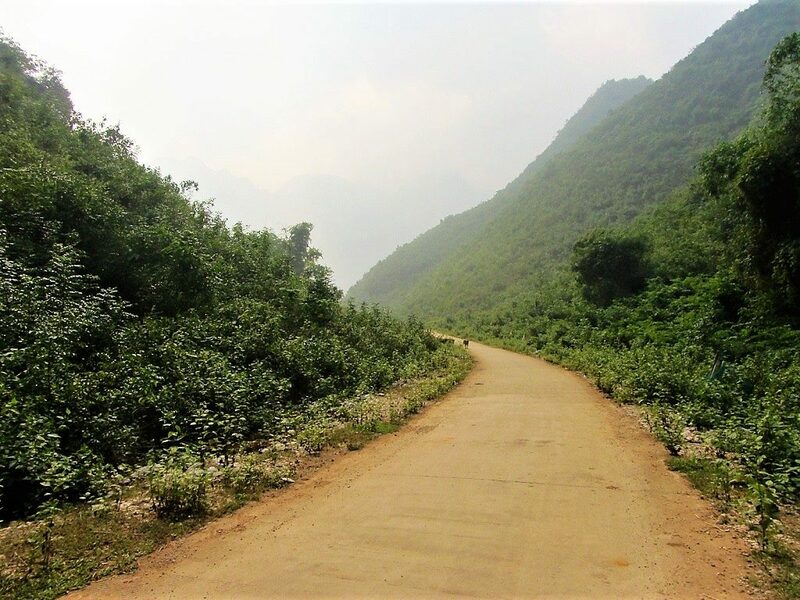 There are some very steep climbs on this route: the pass between Hoa Binh and Mai Chau is big, and the roads inside Pu Luong Nature Reserve are very steep too. But it’s certainly doable by bicycle and very scenic too. On the whole I think this is a good, if challenging, cycling route. However, the long crawl out of Hanoi won’t be too fun – consider putting your bike on a bus to Hoa Binh or Cam Thuy and starting the ride from there. Thanks Tom, that is great advice! Factoring in elevation, weather and scenery what would be your recommended route? I’ve been through so many different options (even other countries) and it is hard to lock in a decision. A loop would be best so my friend and I can just hire bicycles. From what I have read maybe the Golden Loop is a better option then? Yes, there are lots of good loops. The problem is the weather in December/January – it’s best in the south at that time of year. Anywhere north of Nha Trang can experience changeable conditions, and anywhere north of Danang can be pretty bad. But this is always just a chance you take. If you want guaranteed good weather then stick to the south: have a look at my Tet Lunar New Year Classic, for example. The Golden Loop is great too. But there’s a bit more of a risk with the weather in that region. Having said that, I had perfect conditions there in January a few years ago. For more about Vietnam’s complicated climate see this. As for elevation, unless you stick entirely to the coast, you are going to have to deal with some pretty big climbs. But the reward is fantastic scenery. Personally, if I was to choose a cycle route for December/February in Vietnam it was be in the south, probably the Lunar New Year Classic, or at least parts of it. You can browse all my southern routes here. Thanks Tom! That route looks great too. Going to lock this in!! Sorry, that is not really a helpful comment, but it was something I wanted to say. I will say I really enjoyed the ride from there to moc chau, especially the first third or so. In fifteen minutes I had escaped to a new world of freshness and open road. If you are in mai chau and not visiting the north, you can get a quick taste by riding out an hour towards moc chau and returning. Yes, I know what you mean – Mai Chau is kind of a victim of its own success. But it is still a beautiful position and once you find a homestay you really like it still has plenty of charm. However, Pu Luong Nature Reserve is the place to be right now in that area. I stayed at a guest house in Na Meo about five or six years ago if anyone is interested in staying there. On the Laos side there was no place to stay, basically just one noodle hut and eight or so people selling goods on the ground. A truck came by at some point and we loaded up in that. Can’t recall where we went but had a place to sleep. Thanks for sharing, Chris. Yes, it’s a very remote border at Na Meo, but beautiful! I’m at the Valley View Hotel in Mai Chau. This was my first stop from Hanoi and I am torn between going through the Limestone loop and Pi Luong or going up north making my way to Sapa and Ha Giang or staying down here and exploring this area before turning towards the Ho Chi Minh road and beginning my journey South to HCMC. It’s June 15 now and my schedule is open until early August. This is my first time doing something like this and I guess I am looking for feedback and suggestions. Both of those routes are good. If you go north to Sapa and Ha Giang then you’ll be in the mountains all the time. But if you go to Pu Luong and then south on the Ho Chi Minh Road you with be in the south sooner and therefore have more time for coast and beaches. So it just deepens what you want to spend more time doing: mountains or beaches. With the amount of time that you have, you should be able to ride north to Sapa and Ha Giang, and then start heading south back to Mai Chau and Pu Luong and onto the Ho Chi Minh Road too. Just did Road 15 south to north – sure, the road is wide and smooth after Quan Hoa, but the industrial mess around is a horrible eyesore. It’s like a war zone or an open wound gone bad almost all the way from Quan Hoa to Mai Chau. Looking at the state of it it now it will be so for at least some years to come. Avoid, if possible. Thanks for the update – I was there recently and am currently re-writing the entirety of this guide. We travelled part of this route last week to enter Laos. QL217 was paved but bumpy from Cam Thuy past Canh Nang. After QL15 split off, QL217 was perfect with brand new pavement all the way to the Laos border. There were a few short sections where the construction hasn’t finished, but overall it was a beautiful drive on great road to the border. We had no issues bringing a Vietnamese bike with blue card (not registered in our name) through the Na Meo border into Laos. Thanks for the updates. Great to hear that the road to Laos is in good condition and also that you had no problems getting your bikes across the border. I hope you enjoy riding there too. I did slightly modified sections 1,2 and 4 and oh man, this was amazing! Thanks for bringing my attention to this less known part of Vietnam, was fantastic finishing of my Saigon-Hanoi trip (I thought that after Phong Nha I saw the best parts already, but I was wrong!). Pu Luong is amazing, I did a trip across the whole reserve (https://www.google.com/maps/d/edit?mid=zqqWp7oQqYc0.kGGNtBCbnd44&usp=sharing), and it was probably the best ride I had since leaving Saigon (and it says a lot). Yes, it’s a great way to cap off a south to north road trip. Pu Luong is fabulous, especially now that some of the roads running through the nature reserve are now paved – not all of them though, as you discovered! 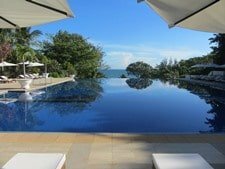 I’ve been frequenting your site now for a while and have kept coming back to it after researching and planning a trip to Vietnam for months, sifting through MANY blogs and agencies and travel guides. Thanks – like so many have said – for for providing such a quality source of information!! SO INVALUABLE. My question is simple: how long did it take you to do this trip? I know everyone’s pace might be different, but I was wondering what yours was. Did you just break up each section into a day? (Sorry if this question has already been asked!) Any help would be much appreciated. Happy to hear you’ve enjoyed reading my site. The Limestone Loop is best done in 3-5 days. You could easily take a week if you had the time. However, there have been reports (see above comments) that the section between Mai Chau and Quan Hoa is currently under construction, so check with locals before you ride this section. Yes, you could make each section a day, but you can remain pretty flexible for most of this loop. The only section that you really need to do in one day is the Lao Loop because there’s no accommodation on that section and it’s relatively long. Hi, thanks for this information! I’m planning a North-South trip and your website has been extremely helpful. About the homestays, when you do these trips, do you just show up in the town in the afternoon/evening, and find a homestay to stay at? Or is there somewhere where you can find phone numbers and call ahead? Mai Chau will be the first stop on my trip and i’d really like to stay in a homestay. I found some phone numbers on Travelfish for guesthouses, but the article was written over a year ago and things change fast in Vietnam! Yes, in general I do just show up and find a homestay. In Mai Chau there are so many that it’s not necessary to book in advance, unless perhaps if you are travelling on a weekend or public holiday. 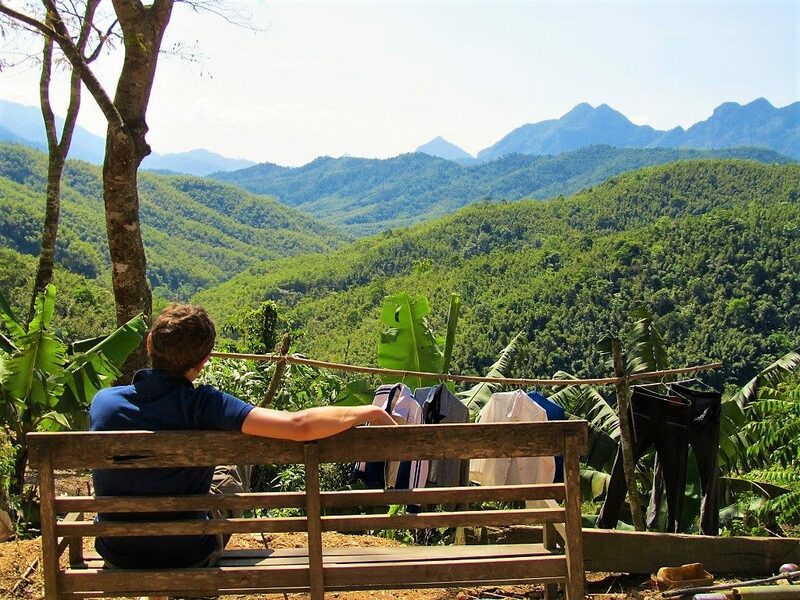 The homestays in Pu Luong Nature Reserve are not as frequented as those in Mai Chau, but they do sometimes receive groups of walkers, who can take up all available space – but you’d be unlucky for that to happen. We would like to do this loop next April, and we would like to know how many days you would recommend to do it. Thanks a lot for your help and for sharing your travel experiences on your blog! We did the Ha Giang loop last year and it was wonderful! Ideally, 5 days to a week would be a good amount of time to have when doing the Limestone Loop. The distances aren’t that big, but half of the roads are small and windy. Also, before you go, check on the road conditions from Mai Chau south to Canh Nang and Ngoc Lac (Road 15) because there have been some reports of road works as they are upgrading the route (see above comments). Weather-wise April is hit and miss – it can be great, but also damp and misty at times. Thank you for your reply. I’m going to try for finding informations about the road conditions. Thanks again to give us the opportunity to discover Vietnam by your own experience. Sorry to hear that. I was last there in September 2014 and it was OK. Thanks very much for your valuable update. I’m sure other travellers will benefit from this information. I look forward to 2016 when it is finished. This is a great loop and a well thought out guide to it. Good to follow. Nice work. Wow, it is indeed a nice place. I do love the whole thing. Thanks for sharing it.